Without a doubt, pizza is my favourite food. I love it. I don’t think I’ve ever had a pizza I didn’t enjoy, but let’s be honest, even a bad pizza is still better than pretty much any other food. Amirite? Thanks to the wonder that is Slimming World, pizza is not off the menu even though I’m trying to lose weight and I get to have it pretty frequently. 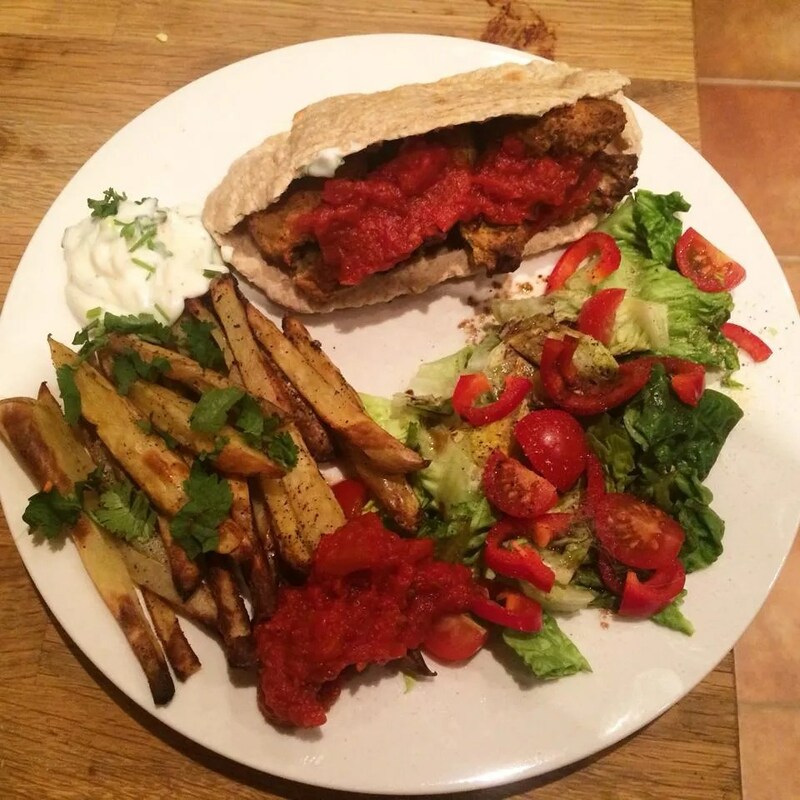 My favourite way to enjoy it is using a wholemeal pita for 6 syns, or a Bfree gluten free tortilla wrap as my HEXB. I have pita pizza and SW chips most weekends, topping the pita with syn free tomato sauce made from passata, herbs and garlic, sliced chorizo or veggie sausage, peppers, onions, and my HEXA reduced fat cheddar. 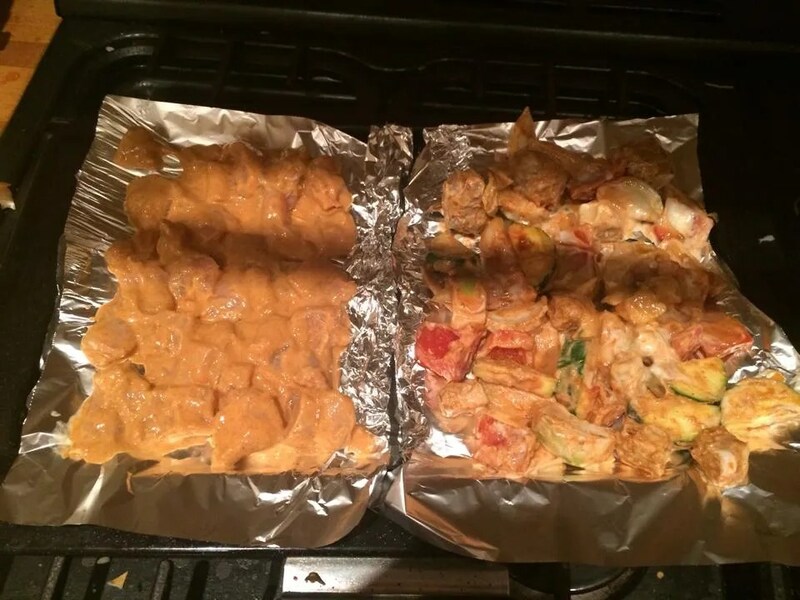 I also make the perennial SW fave ‘Pizza topped chicken’ quite often, with either actual chicken or Quorn fillets. This is a nice alternative, and it means I don’t have to use my HEXB on bread for the base. The recipe is pretty simple and you can really add as few or as many toppings and extras as you like/can be bothered to chop. I used spinach, basil, red onion, vegetarian sausage, tinned mock duck (all free) and synned black olives and mozzarella. Start by chopping the cauliflower into florets, and then chuck into the food processor. Blitz it until it resembles rice and is all evenly sized. Pop the cauli-rice into a bowl and microwave for 6/7 minutes until it’s cooked through. Now, here comes the fun bit. Most recipes call for you to put the cauliflower into a clean tea towel and squeeze it until all the moisture comes out. I tried this for about 2 minutes with kitchen towel as we didn’t have a clean tea towel, and let’s just say it didn’t go well. I burned my hand with the steaming hot cauli, and the kitchen roll cracked under the pressure and ripped. Thinking on my feet, I decided to just gently dry fry the cauli in a pan so it would get rid of all the moisture that way. Spoiler alert – this works really well! Here’s the pan-fried cauliflower all dry and lovely. Then add the beaten egg and all the herbs and seasoning. 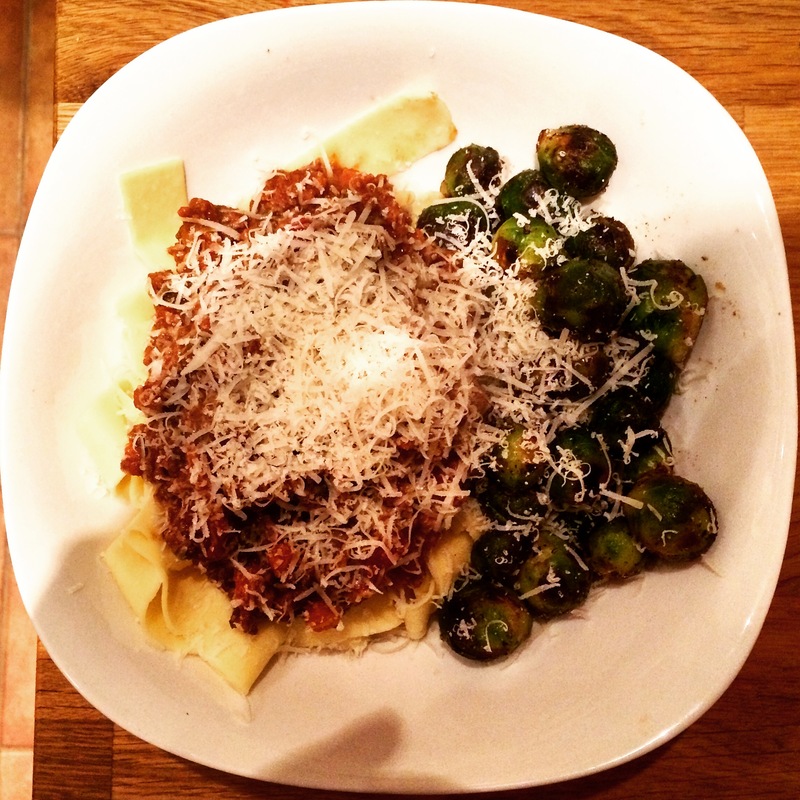 Food bloggers who aren’t following SW generally add grated parmesan in here, and while I don’t doubt this is delicious, ain’t nobody got time for parmesan syns on Saturday night when there’s a bottle of wine in the fridge. Stir the cauliflower and egg together and you’ll be left with a bowl of wet mush. Mmmmmm. It won’t go doughy so don’t worry if it doesn’t look like you’d expect, the egg works as a binder in the oven and dries it out. Pop your base onto a sheet of greaseproof paper and shape it into a nice circle. Bake it for 10 minutes, flip it over, and bake it on the other side for another 10 minutes. It’ll be quite delicate when you try and flip it so be gentle – let’s not forget it’s essentially egg and cauliflower so not structurally sound! Here’s the finished crust! Yummy! Et voila! I baked it for a further 20 minutes on 180 until the cheese was bubbly, and it was perfect. I ate it quite simply with a green salad and the slices were just sturdy enough to be held, so it felt like a real treat. I’ll definitely be making this again. As I said, it was time-consuming but not hard work, it’s just because of the number of steps involved in making the base. I believe some supermarkets now sell pre-made cauliflower rice which would speed up the process a bit, but I’m not about to spend £2 on 100g of cauliflower when I can buy a whole one for 90p. Each to their own, though! Let me know if you try making cauliflower pizza, and I’ll be back soon with some very much non-Slimming World Orlando food bloggage! Actual married. 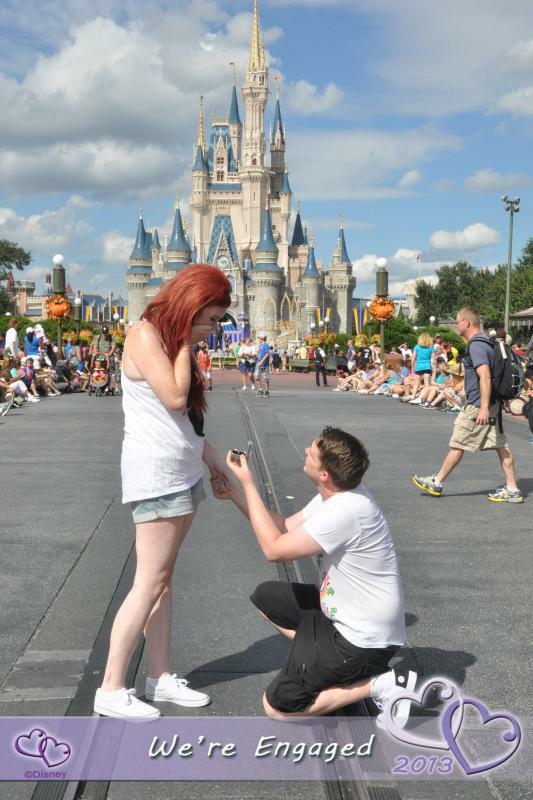 In Walt Disney World, like we always dreamed, with 30 of our amazing friends and family. It was absolutely incredible and I will be doing a post shortly about the wedding itself as we’ve got all our professional photos back now, and if I’m honest I look for opportunities to share them wherever and whenever I can. 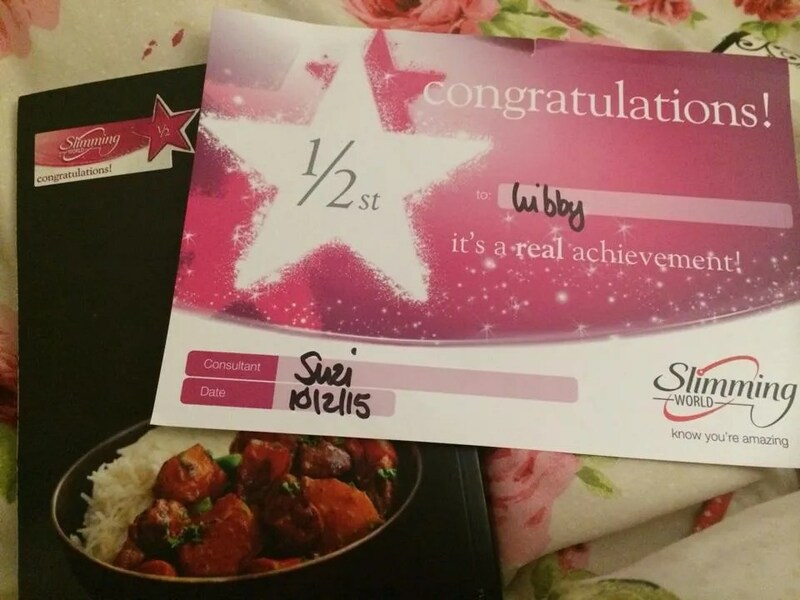 Another thing that happened was losing 2 stone and reaching my Slimming World target! It took a year and a half but I hit target August 2016 and felt incredible on my wedding day in October. Yay! I then ate all the food during our 3 week Orlando/Bahamas honeymoon food-filled bonaza, carried on during the run up to Christmas, over Christmas, and let’s be honest, after Christmas. So I have put some back on, but it’s totes manageable and I’m getting back into the SW mindset now after a few months being a lot more leniant. Which actually felt so good and enjoyable after being so strict for so long! 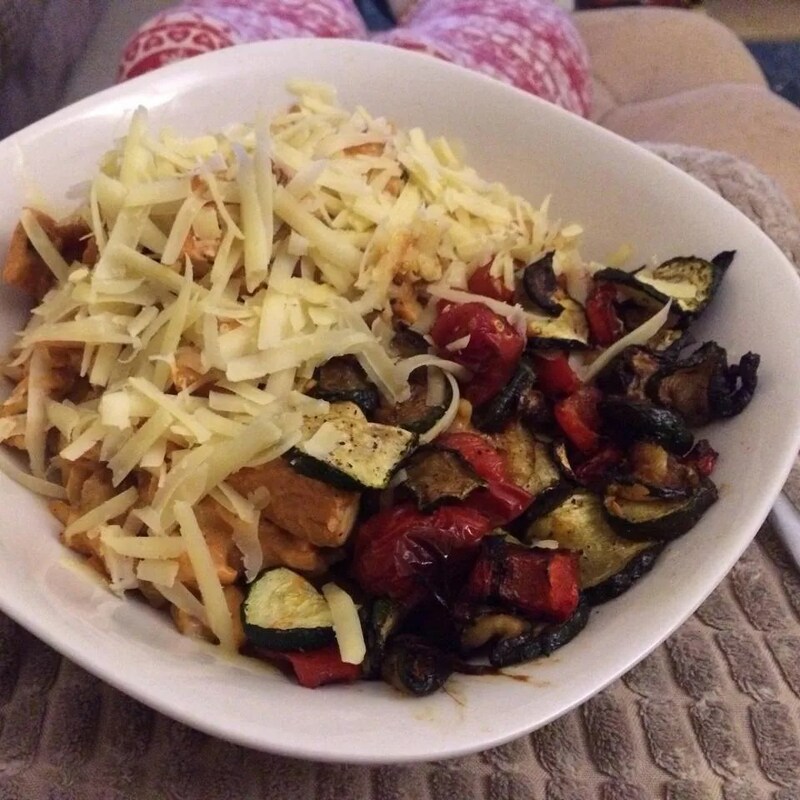 So I thought to ease myself back into blogging, I’d delve back into the archives and share some more of the Slimming World meals I eat regularly. Thanks to my keen Instagram usage I’ve got many a dinner documented, so it’s just a case of remembering what it actually was. I’m also going to share some of the awesome food we ate during our Christmas 2015 trip to Orlando where we planned our wedding, and during the wedding trip itself. While it’s not Slimming World (Obviously! Can you imagine, ‘Let me just work out the syns in this table-sized platter of 30 garlic shrimp, loaded mashed potato skins and butter drenched green beans.’) it was all delicious and needs to be shared. 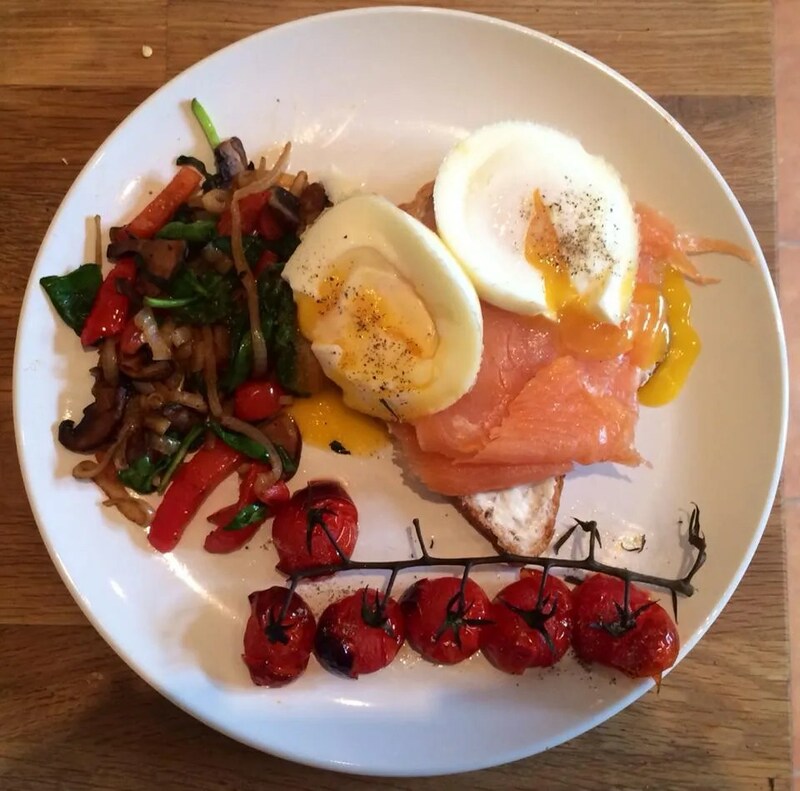 It’s all about balance anyway – I lost weight so I could look amazing on my wedding day and eat what I wanted on my honeymoon, but I couldn’t eat like that all the time as I think I’d possibly maybe die. Or at least weigh 70 stone. First up is this delicious tomato and basil pasta. 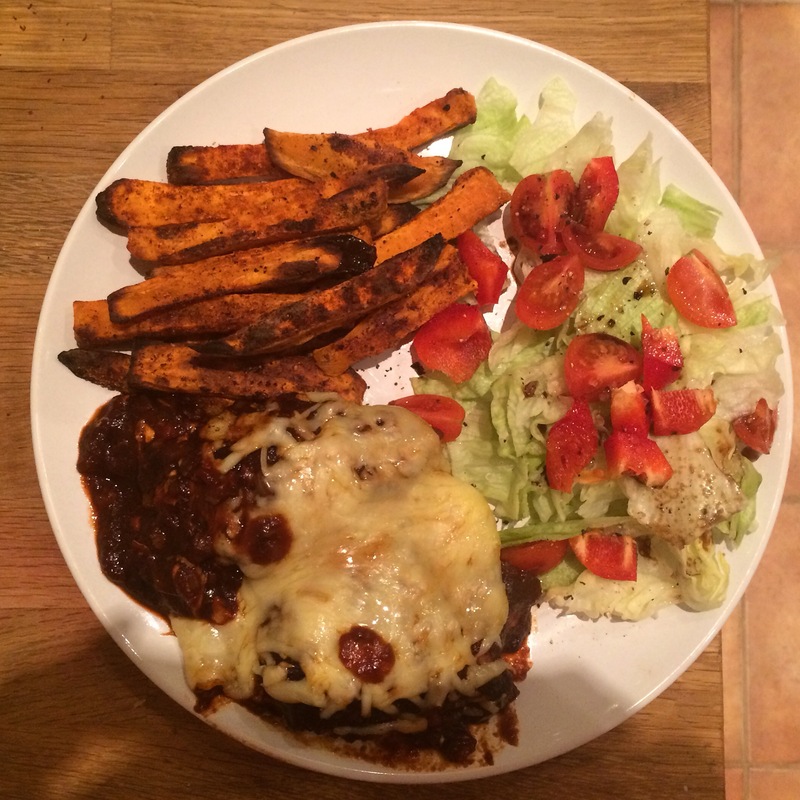 Quorn sausages are hidden underneath, and I topped it with my HEXA cheese, chopped basil and 1 syn of balsamic glaze. 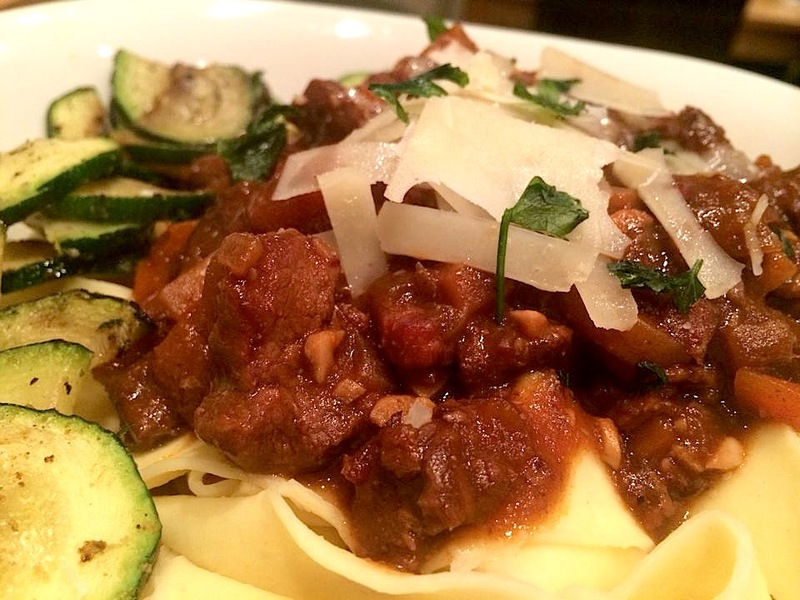 Easy, simple, delicious. Curry fakeaway night! 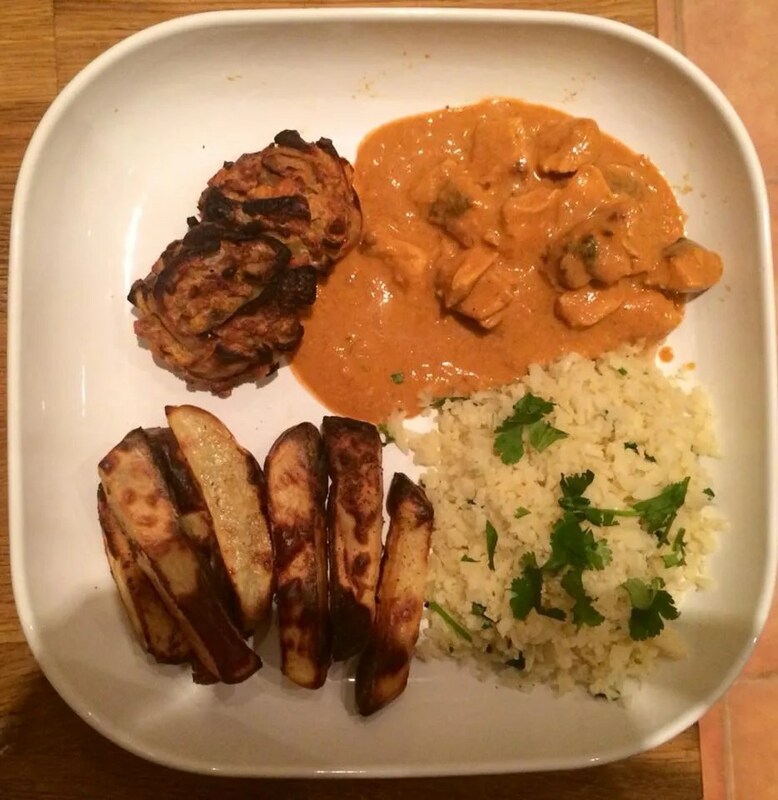 I used the Slimming World spicy tikka sauce from Iceland but it was quite thin and watery so I added some passata to thicken it up, and then a Muller light coconut yoghurt to make it more korma-esque. It was really nice after that! 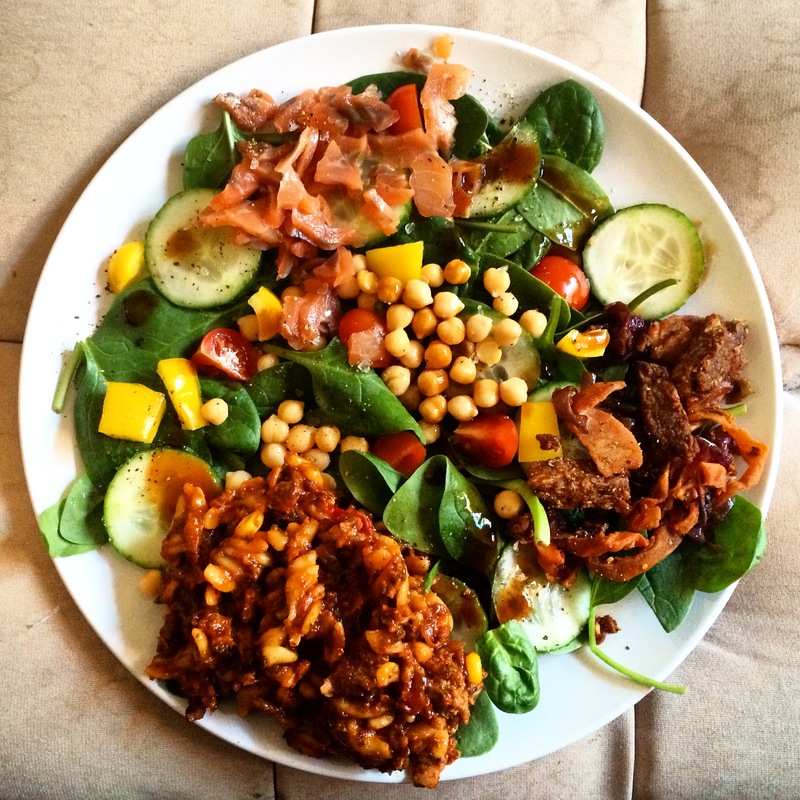 I used tinned mock duck and chickpeas as the protein, teamed with double carbs and a medley of speedy spinach and courgette. So good! A classic SW breakfast! I believe this was created as a result of feeling slightly hungover one Saturday morning…oops. SW arancini with roasted cauliflower, salad and spicy tomato sauce. 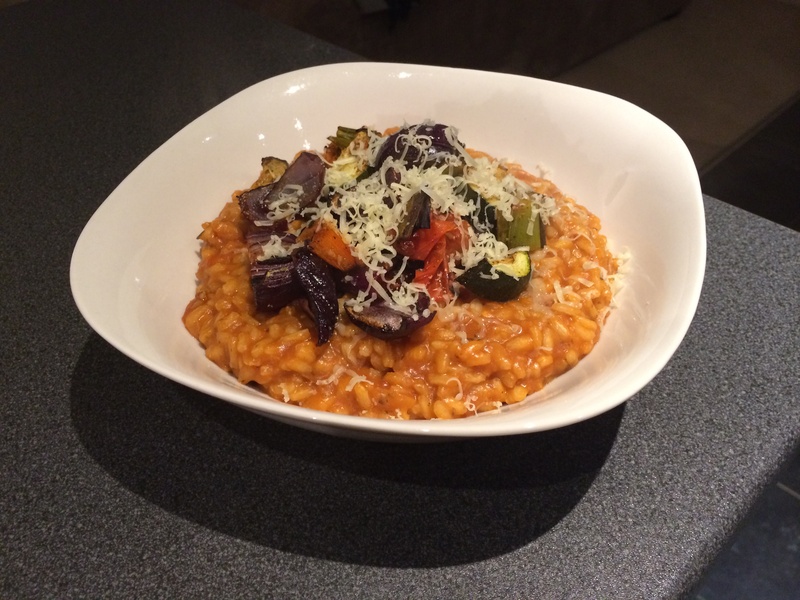 I make the arancini using leftover Slimming World risotto, but it would work with just leftover rice too. I shape the cold, leftover rice into balls, add a cube of reduced fat cheddar or mozarella into the centre, and then shape the ball of rice around it. I then dip them in beaten egg, and again in breadcrumbs (2 slices of wholemeal bread blitzed up makes enough for 2 people’s worth of arancini – around 8 balls if you’re doing them this size) and bake them on a tray in the oven with a bit of fry light. They go all crispy on the outside and the cheese melts and it’s a thoroughly enjoyable experience! This was butternut squash and bacon carbonara. 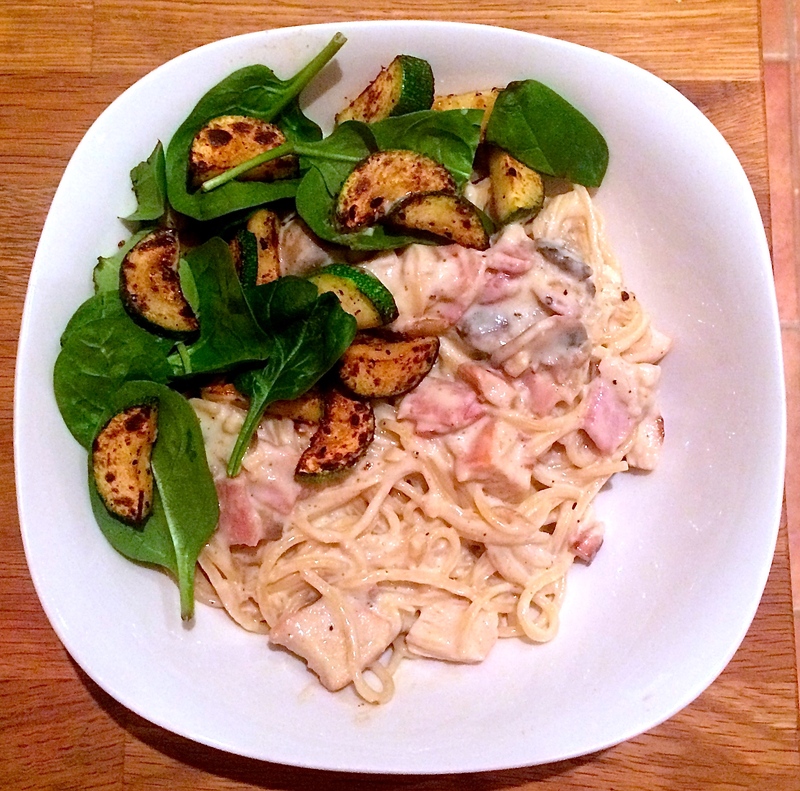 The recipe is roughly the SW carbonara with quark and eggs, but I added roasted butternut squash which not only adds a lovely sweet flavour, but also bulks out the meal and ensures you’re getting that 1/3rd speed. Basically roast cubed bnut squash for about half an hour until it’s soft and getting browned, then stir it in with the sauce (quark, eggs, garlic, bacon, seasoning) and add it all to the pasta. So good. I need to make this again! 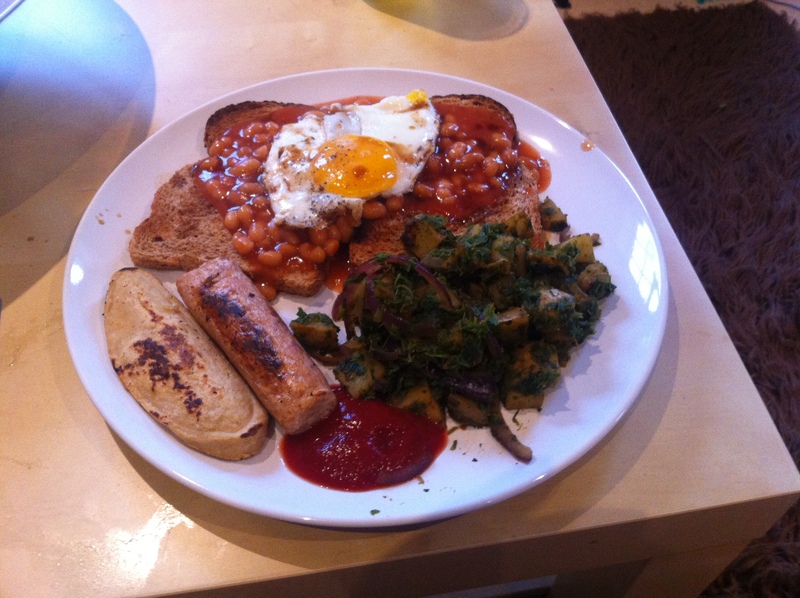 This was a breakfast/brunch recipe that I discovered last summer and basically made every weekend for about 6 months. It’s based on one of Joe Wicks’ Lean in 15 recipes – sweet potato cakes with spinach, sausace (or bacon) and a soft poached egg. I love it because it’s super easy and if you’re mega organised you can make 10 at once and freeze them, but I’m not so I didn’t. But one day I will. You just peel and cube 2 sweet pots, microwave them for 8 minutes, add chopped onion, garlic and seasoning, and shape them into patties. Dry fry them for 5 minutes or so until browned, wilt the spinach and add the chopped sausage or bacon (this can cook while you’re microwaving the sweet potato) and then poach your egg! 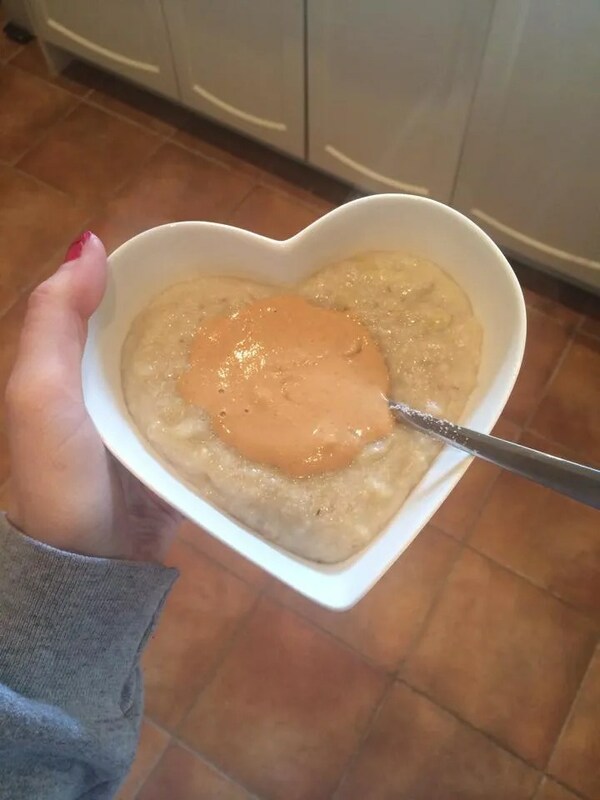 So simple and so good – a great way of avoiding using your HEXB in the morning which is something I really struggle with as I live for toast/cereal/porridge/anything that requires a HEXB. A typical work lunch for me! 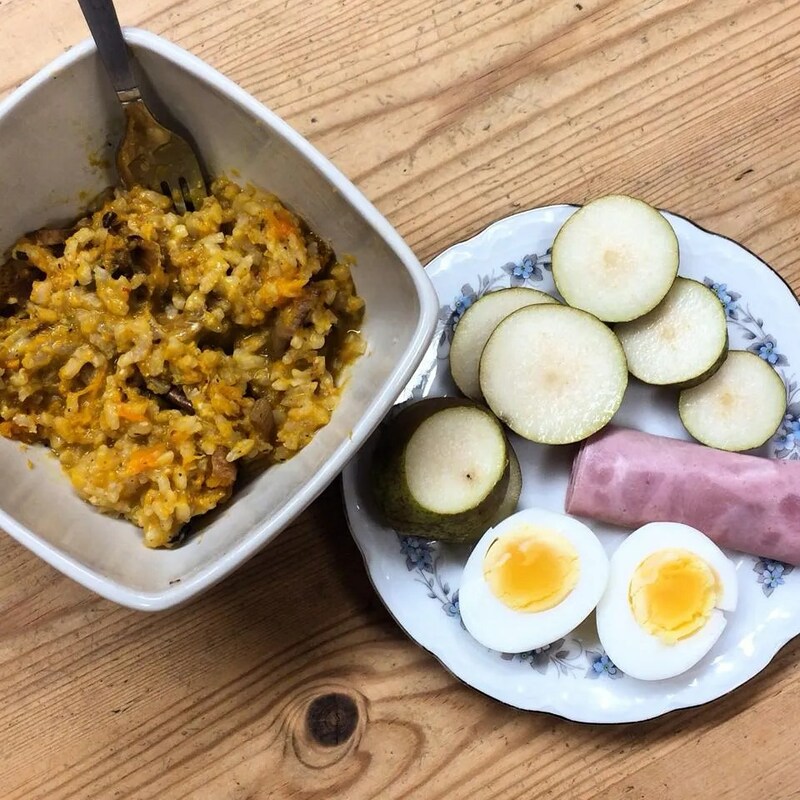 The big tub is couscous with veggies in, smoked mackerel in tomato sauce, and boiled eggs. I obviously add water to the oats once at work cause ain’t nobody got time for dry oats, and I keep a tub of Nutella in my drawer to add that all important chocolate hit to my porridge. I went through a Cocoa Shreddies phase for a while and it was really good. This was a desk breakfast (deskfast?) with yoghurt, fruit and choc shot. A slightly underwhelming 1.5lbs off. Hmmm. I was disappointed 😦 I’ve been 100% on plan this week, something which has never happened before on any diet I’ve undertaken haha and I just feel I did everything I could to lose weight. However, I haven’t got a huge amount to lose (1.5 stone, maybe 2 depending on how it goes) so I’m not expecting to see huge losses each week. I guess I just thought for the first week, I’d see 2 or 3. Never mind! Onwards and upwards! One thing that was good is when I got home after group, I didn’t feel a mad urge to drink wine and eat chocolate and treat (cheat!) myself to make up for my disappointing loss. 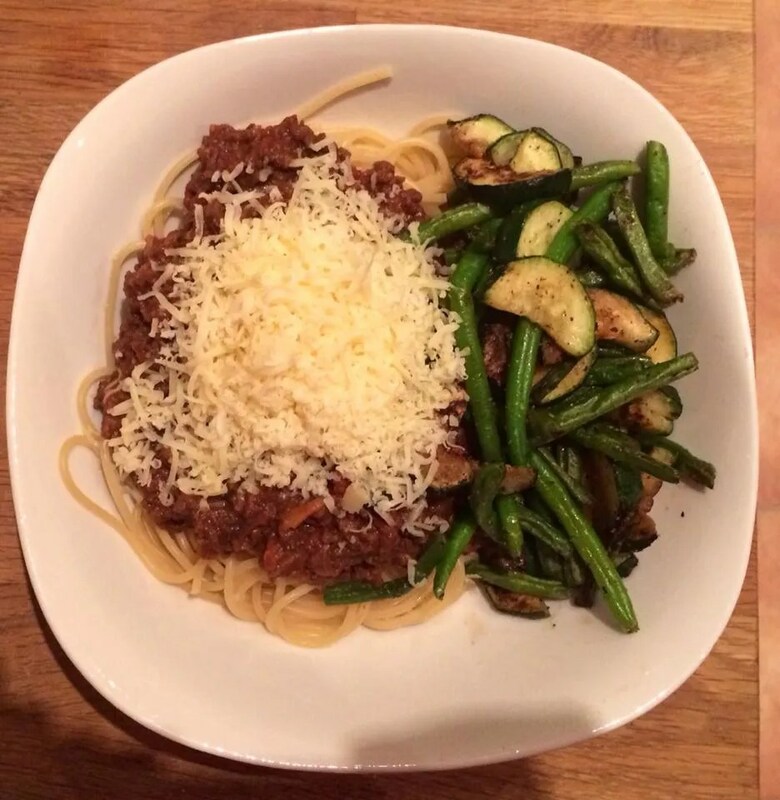 I simply made an on-plan dinner like every other night, and enjoyed it whilst watching Dr Christian Jessen chastise overweight people on Channel 4. Does anyone else LOVE TV shows about diets and weight loss? I’m all over them like a rash, especially this time of year! 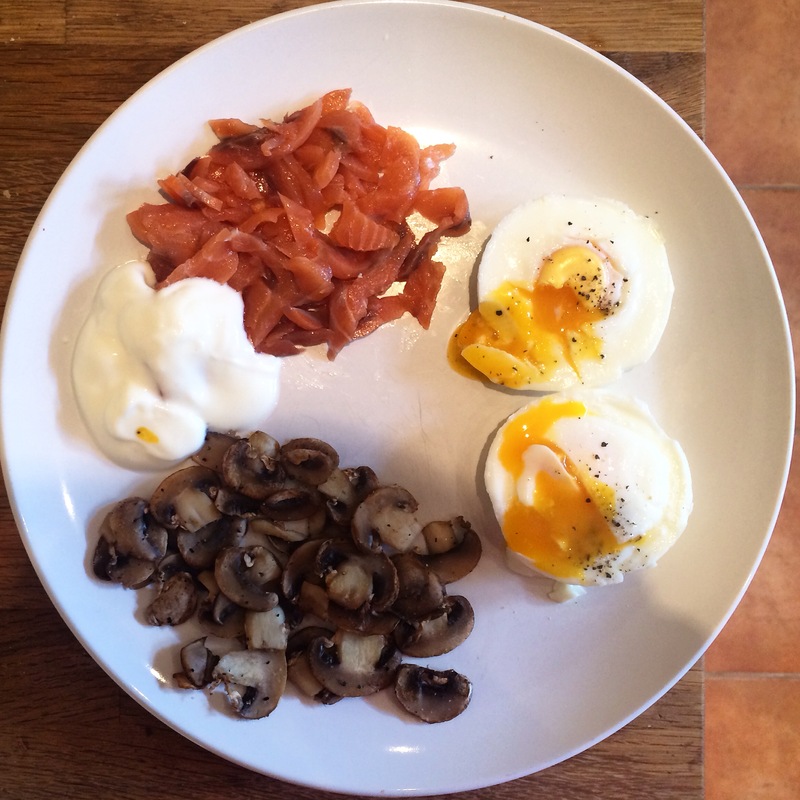 So I’m going to carry on this week as I’ve been doing, introducing more speed foods where I can and making sure 1/3rd of my plate is always speed. Hopefully I’ll see a bigger loss next week 🙂 In other news, my fiancé lost an incredible SIX POUNDS this week! He was absolutely chuffed and I’m so, so proud of him. Go Benj! 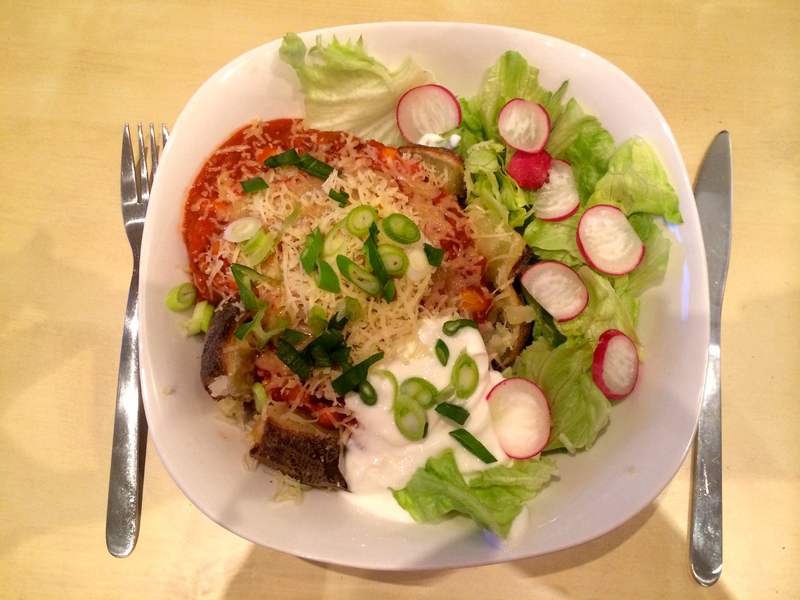 I have made some delicious meals over the past few days, something I am going to continue this coming week. 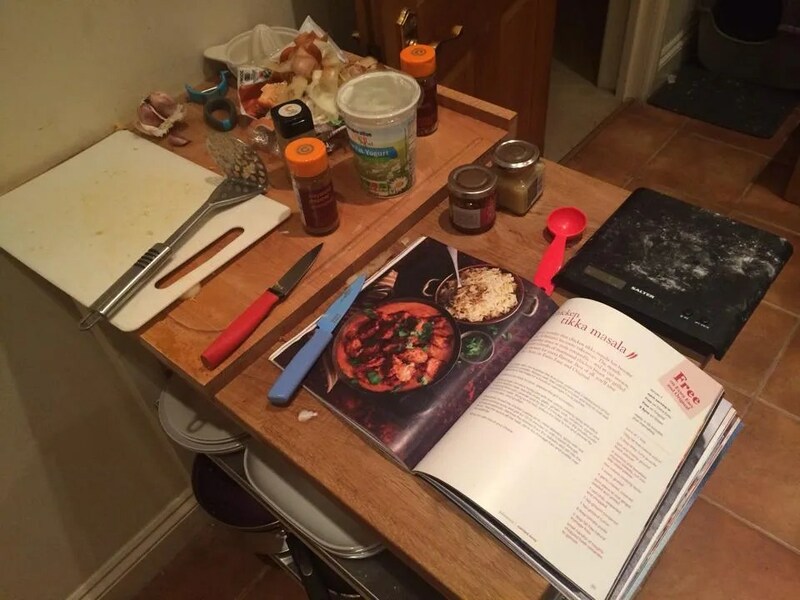 I love trying new recipes and I find it keeps me interested and on-plan. Here’s a brief round up (“Woody’s rounnndddd-upppp…” you’ll get that if you’re a Toy Story fan. If you aren’t, soz) of my eats over the past few days. 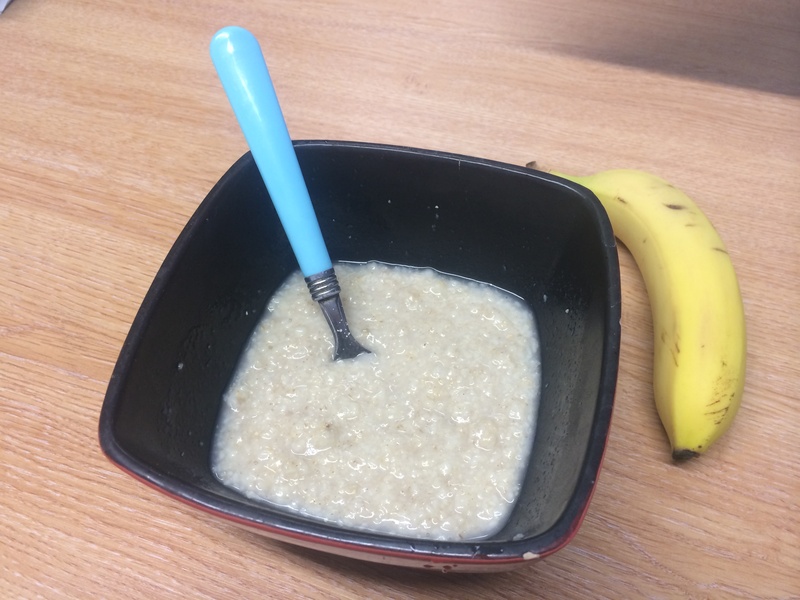 Breakfasts have been porridge and water every day which surprisingly hasn’t got boring, with splenda, cinnamon and a chopped up banana. Still loving this combo! 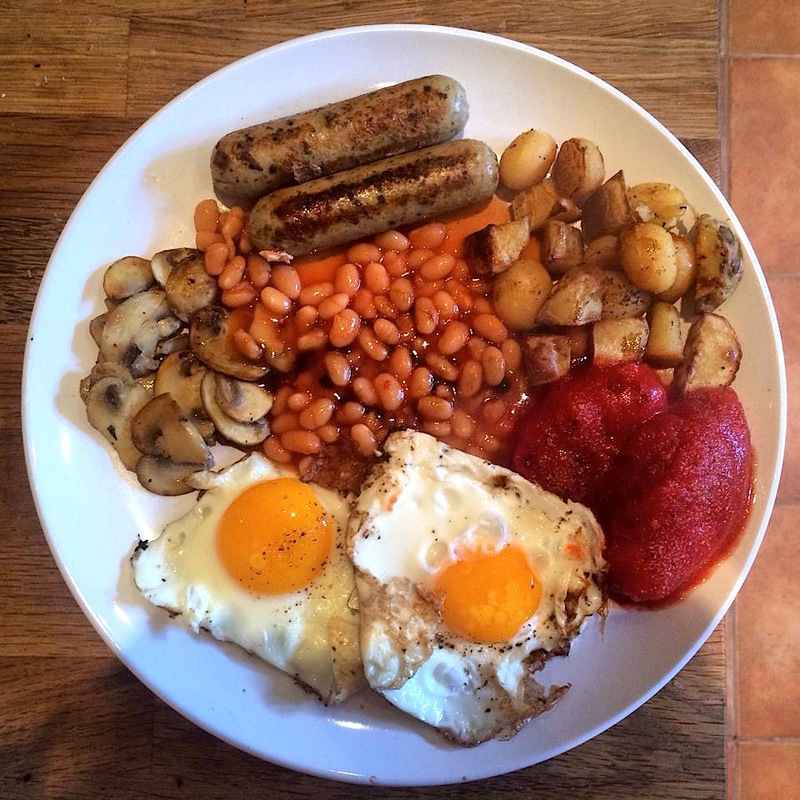 On Sunday I cooked us a massive ‘grill-up’ – Tesco meat-free Lincolnshire sausages, sautéed potatoes, beans, mushrooms, tomatoes and fried eggs. All cooked in fry-light, all FREE! Well, until I googled the sausages and discovered they were 1.5 syns EACH. EACH!! So this was actually 3 syns 😦 Don’t buy those sausages. Unfortunately, I bought 2 bags, so we’ll be eating them for a good while yet. 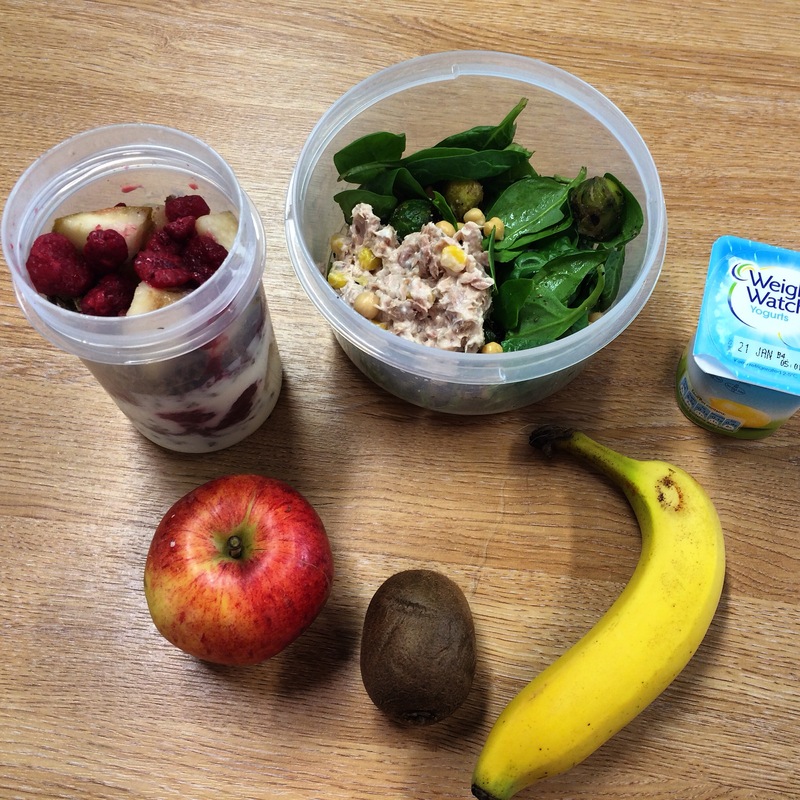 Breakfasts this week will continue to be porridge or fruit and yogurt when I need to save my HEXB for later in the day. 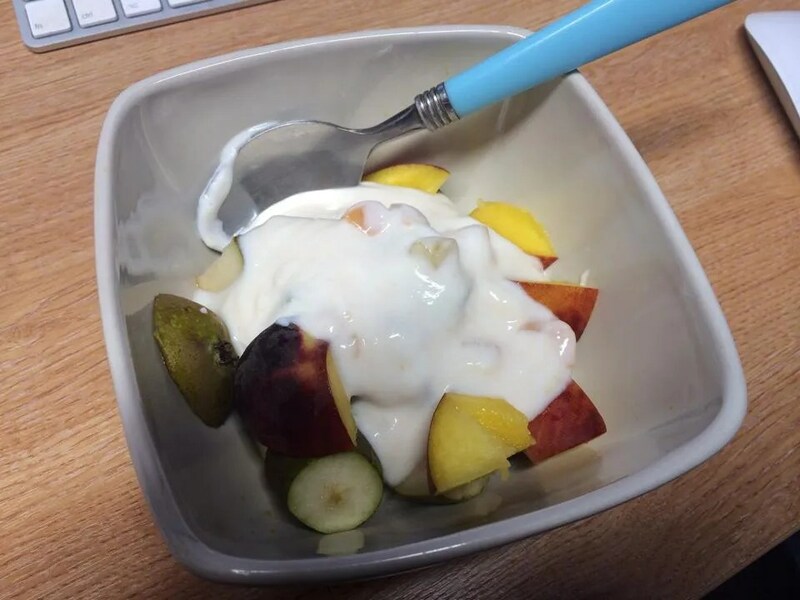 I always thought fruit and yogurt was a bit of a boring, wishy washy standard SW meal (something I strive to avoid in my own Food Optimising journey) but actually, it’s quite nice. 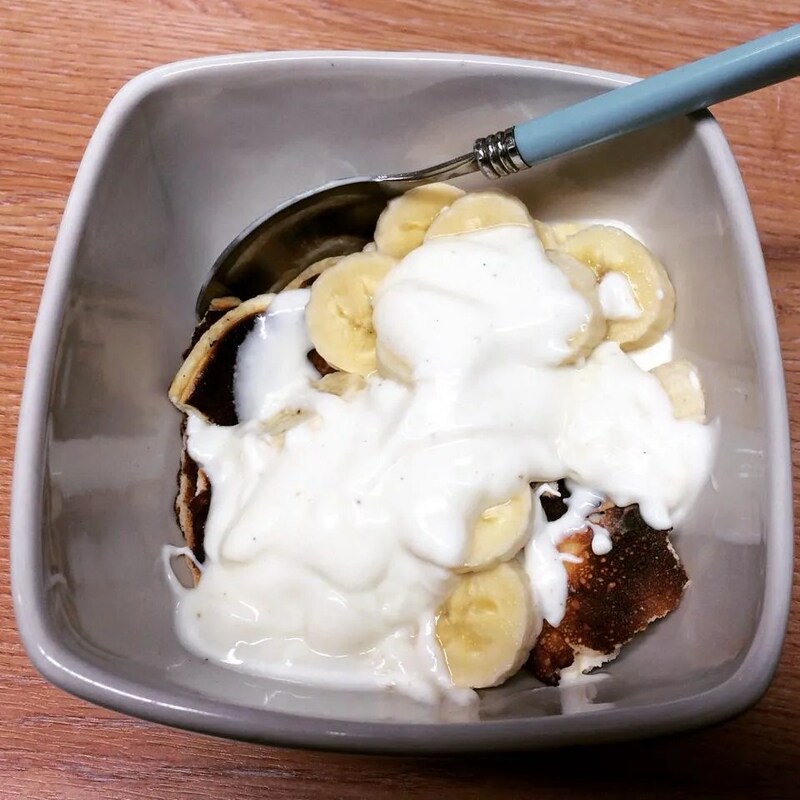 I use fat free natural yogurt, sliced banana and pear, and a WeightWatchers Dessert yogurt on top. These have nice flavours like Raspberry Tart and Lemon Tart, and they just make the bowl way more exciting. These are FREE, but obvi Slimming World won’t be shouting this from the rooftops as WW are their Rivals. Onto dinners! 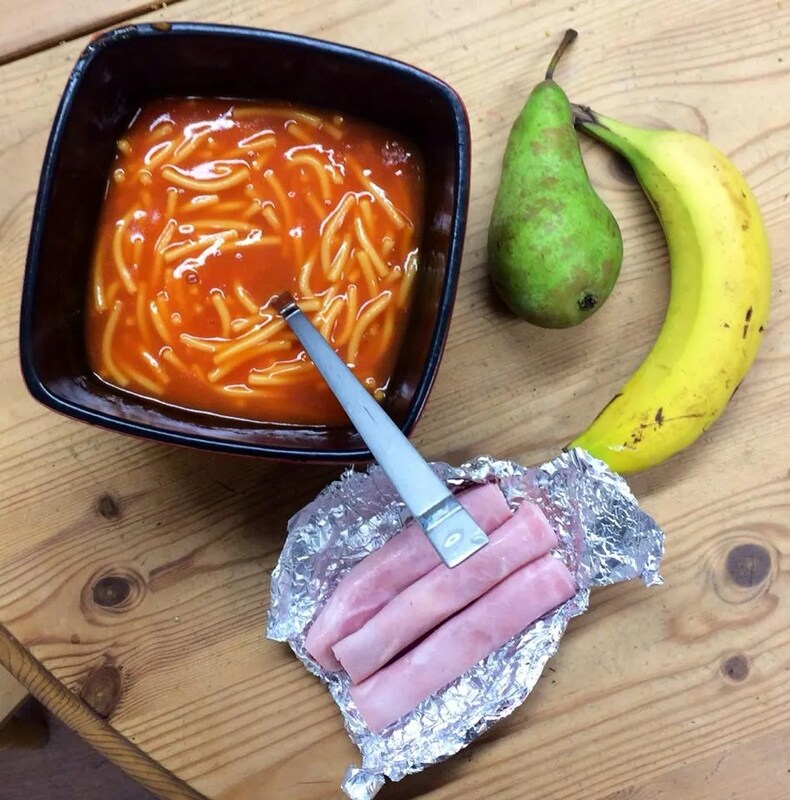 Oooooh I had some lovely dinners over the weekend! 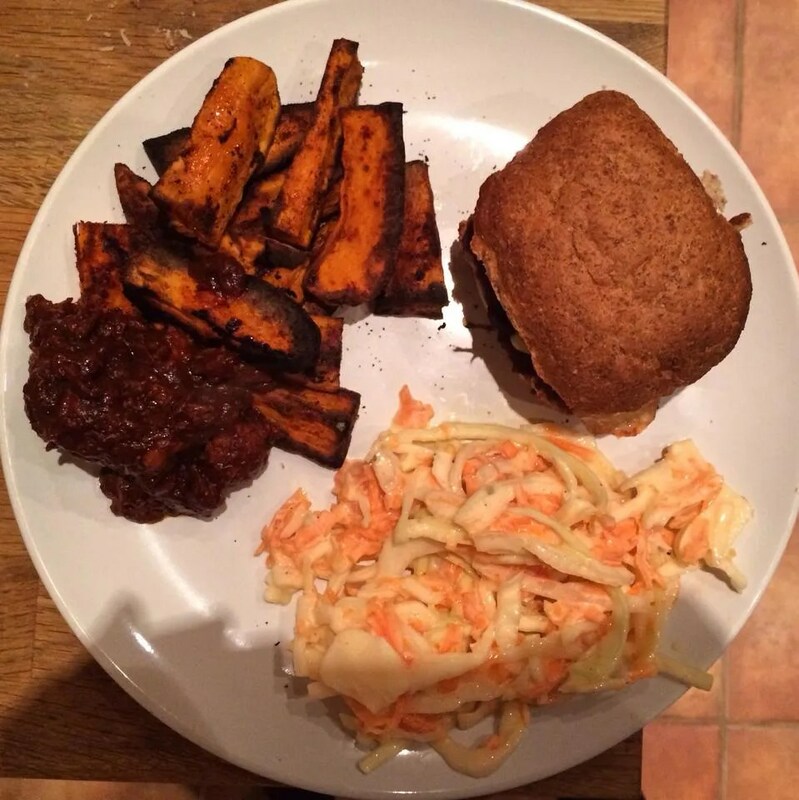 Friday night was burger night in our household! And what a treat that was. We had Quorn burgers, onion, lettuce, HEXA reduced fat cheddar, HEXB wholemeal roll, and I added bacon. So good! I was absolutely stuffed after this! Definitely going to keep these as a weekend treat so we don’t get sick of them, I feel like I could eat them every night though! 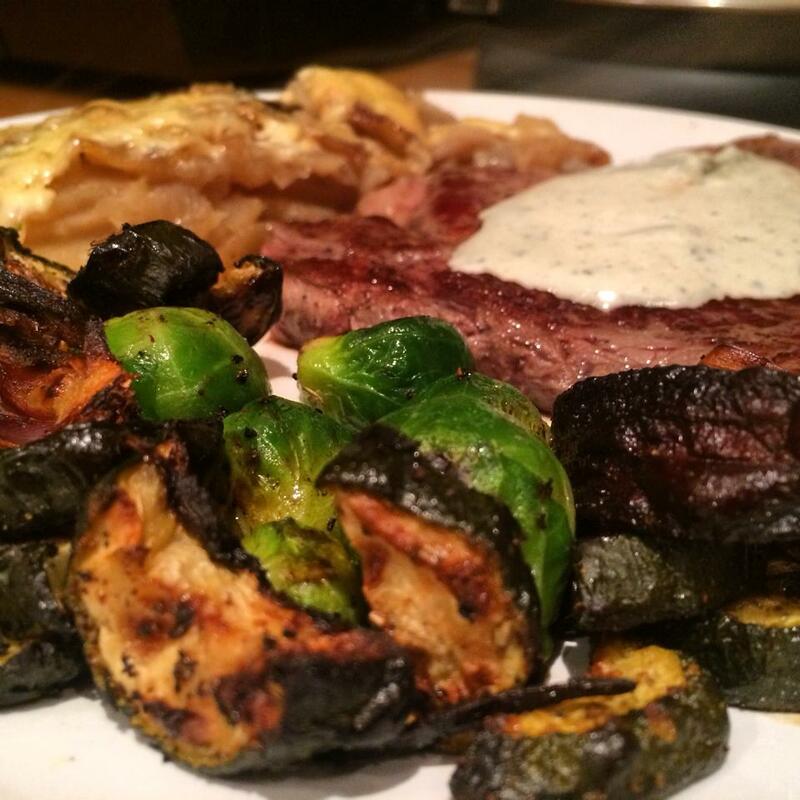 Saturday night I had rump steak with all the fat trimmed off, boulangerie potatoes (recipe here) and roasted veggies. 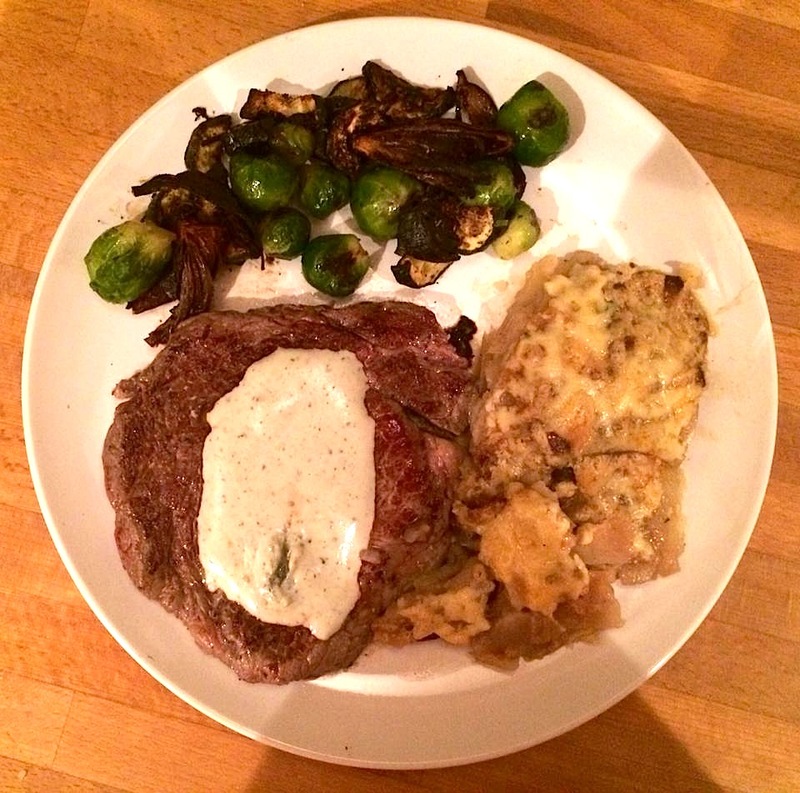 I synned a tablespoon of the heavenly Creme de St Agur as a sauce for the steak. This was lovely! On Sunday I fancied something hearty and warming. 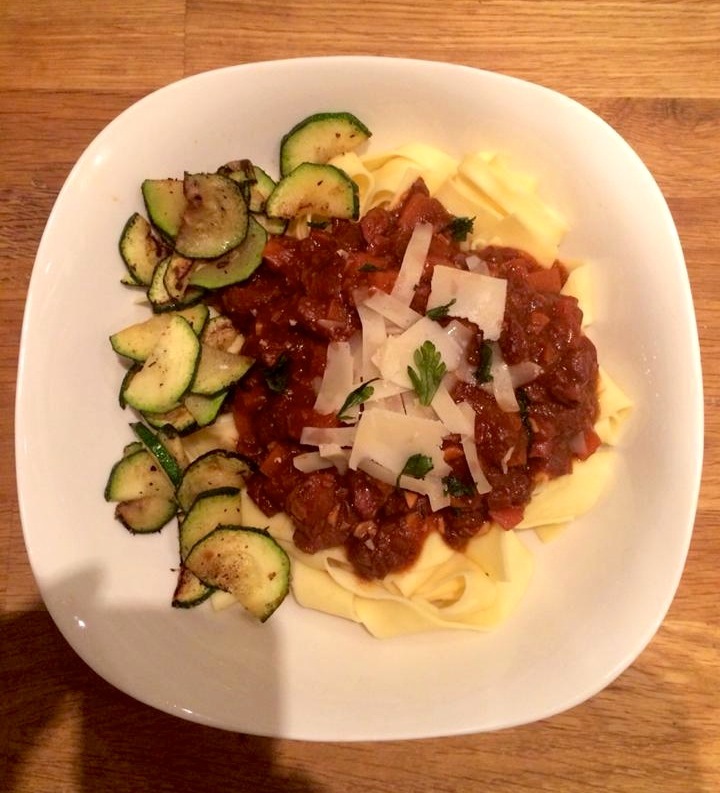 Slimming World beef bourguignon fit the bill! I pretty much followed the recipe exactly apart from adding more garlic and chopped carrot, and leaving out the mushrooms. I also only had 250g of beef whereas the recipe called for 700g, so it was a much smaller portion! I served it over parpadelle pasta (free!) and sliced courgettes, with my HEXA of parmesan. You get a LOT of parmesan for your HEXA! Monday night was a bit of an gamble, but it turned out really well! I had planned to do cajun spiced chicken thighs but we didn’t have any cajun spice. I used a bit of southern fried potato seasoning that was kicking about in the cupboard instead, simply rubbing it onto the thighs after removing the skin and all visible fat. 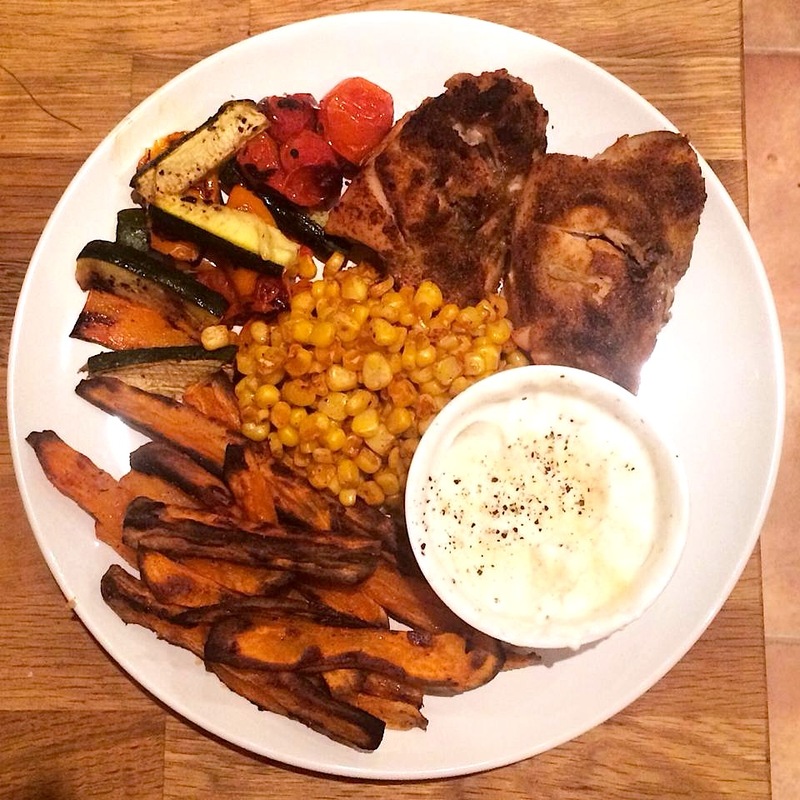 Served with roasted vegetables, sweetcorn, roasted sweet potato wedges and a garlic yoghurt dip, this was amazing! 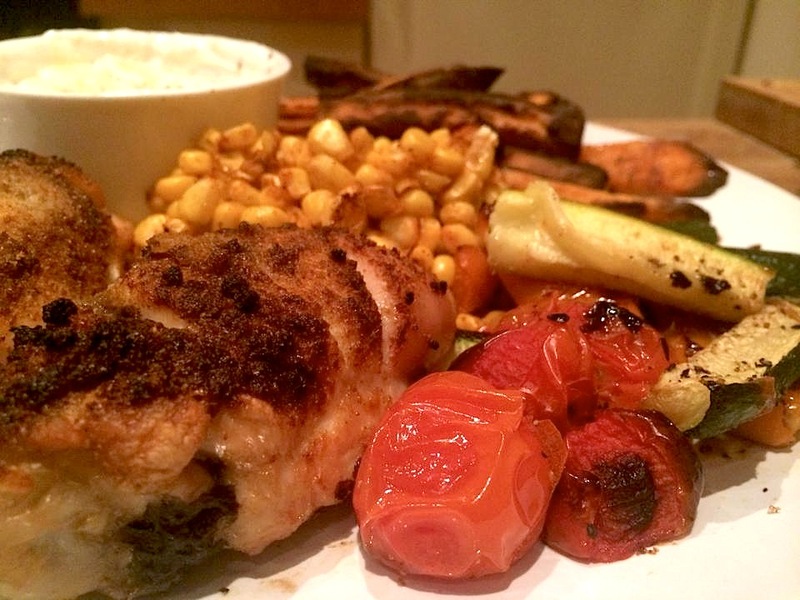 I love meals like this, with lots of different flavours and textures. Finally, after weigh in last night, I had fish and chips! This was from the Fakeaways book and involved whisking egg whites and folding a yolk in to create a batter for the fish. I’ll be honest, the batter wasn’t great. After being out of the oven for approximately 10 seconds it deflated and went a bit soggy, pretty much tasting like fish with omelette on. Not necessarily a bad thing, but definitely not what I signed up for. I was prepared for this though as I’d read another bloggers experience of making this dish, and she warned this would happen. It looked convincing though and I was pleased how batter-like it appeared! 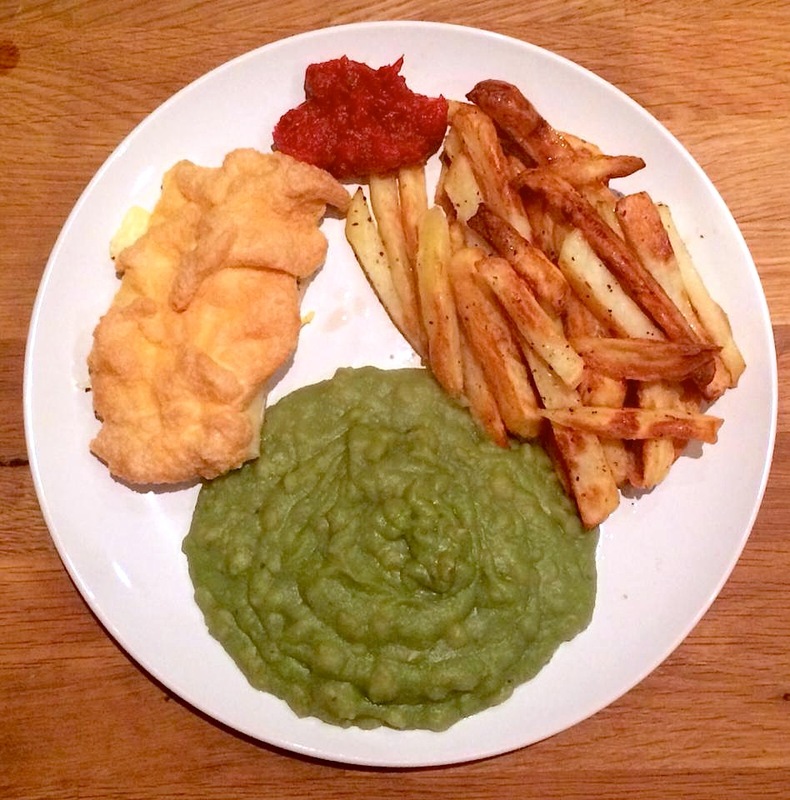 Next time I’ll skip the batter faff and just have the fish plain, as it was delicious anyway 🙂 This was also my first taste of mushy peas (I know, I’m 27 and need to get out more) and I loved them! I mixed in loads of salt, pepper and garlic powder as they were blander than bland to begin with, but after that they were damnnn good! So that was my week! Onwards and upwards to this new week! I’ll be doing our meal plan tonight and getting organised for the next few days 🙂 Good luck everyone else following SW! 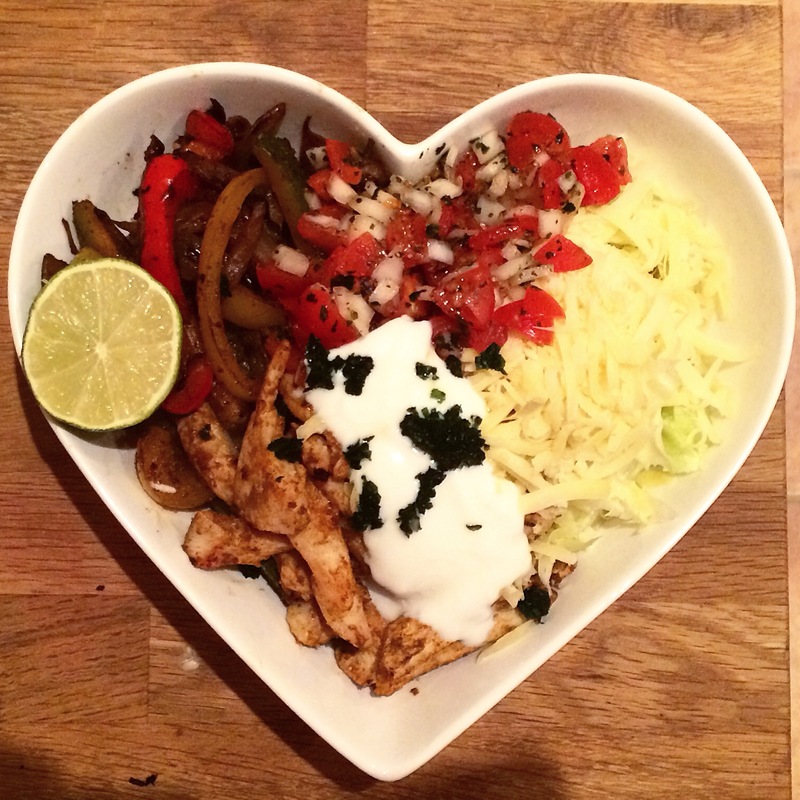 So, my first week of Slimming World! I started following the plan on Monday, weighed in to my new group on Tuesday, and it’s now Thursday night. We (me and the boy are both following the plan!) have been Food Optimising for 4 glorious days. It’s been really great! I already feel better, happier, calmer, and more in control. We pretty much spent 2 weeks over Christmas just eating whatever we wanted and to be honest, by the time we went back to work, I just felt so groggy and bloated. 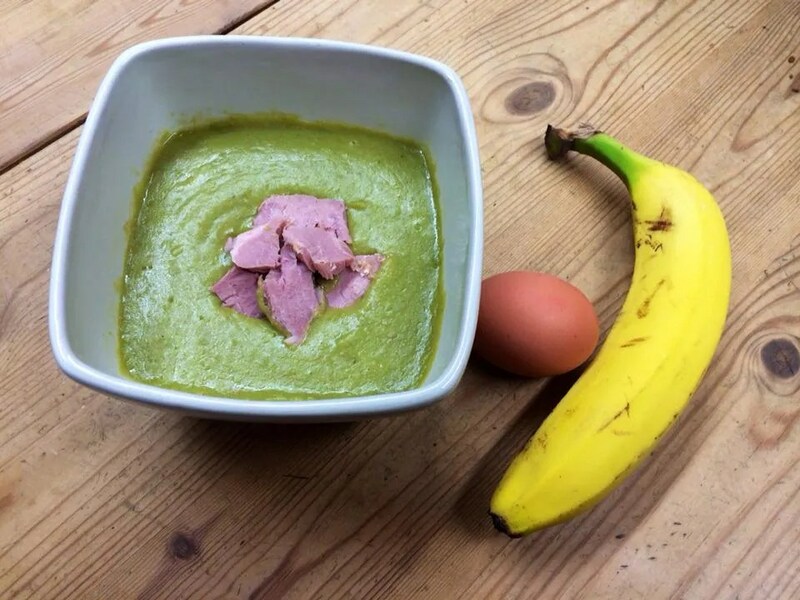 I felt like I’d eaten everything I could possibly have wanted over the Christmas period and I was ready to start eating fresh vegetables, smaller portions, and just generally food that was better for me. Which coincided nicely with my return to Slimming World! My first weigh in was obviously not pleasant, but it won’t be going any higher than that now 🙂 The consultant was fab, the group was friendly, and it’s right down the road from where I live! Very convenient indeed. I optimistically bought a 6 week countdown and I’m feeling SO motivated and excited for the next 6 weeks! I really am going to try to be strict and not have any ‘treat’ or ‘cheat’ days; I hate to be a cliche but I’d only be cheating myself! As I did last time. But we won’t go into that. So, my eats! I’ve been eating some lovely things so far, and we have even more yummies planned for the rest of the week! For breakfasts, I’ve been having porridge. I’ve never really had it before but I don’t know why, it’s so lovely! i’ve been having it with splenda and cinnamon, and also ‘whipped’ with a banana! I slice the banana really thinly and whip it into the oats with a whisk as the oats cook. The banana melts away and creates a really creamy, fluffy texture that also increases the volume of the porridge. I end up with a huuuuge fluffy bowl of oats and it fills me up until lunch, perfect! 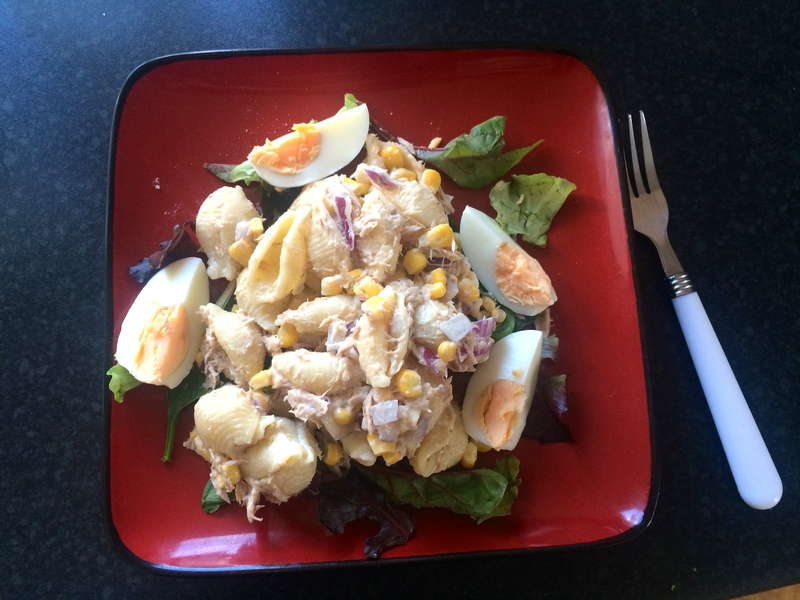 I made a big batch of tuna pasta salad on Tuesday and have been having it for lunch every day. It’s just pasta, extra light mayonnaise, sweetcorn and red onion. The EL mayo is 1 sun per level TBSP and there were 4 in the mix. 4 portions, 1 syn a portion! Yay! I’ve been having this with salad and fat free balsamic dressing, and occasionally a boiled egg if I really want to push the boat out. 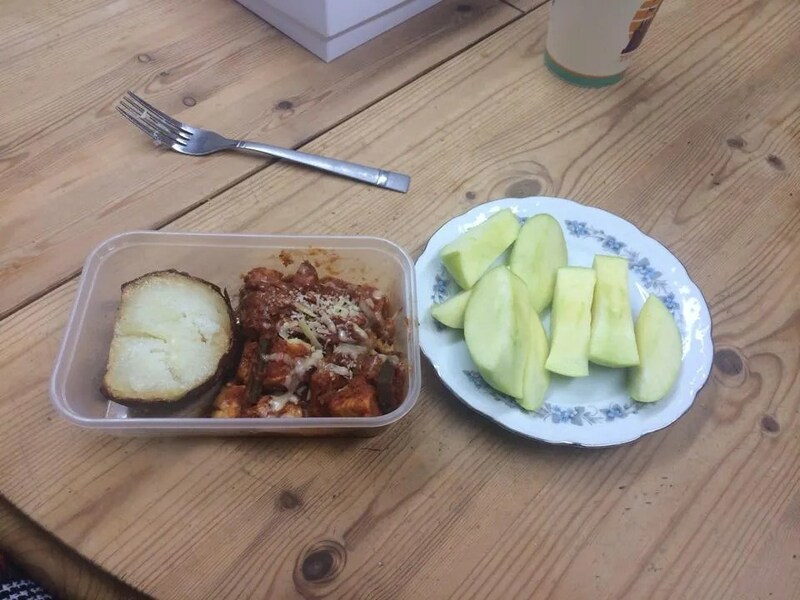 It is REALLY filling – on Monday I just had a salad and I felt all light-headed and horrible all afternoon which I think was a combination of not eating enough, and my poor body complaining that I wasn’t having any sugar or fat. We didn’t have the shopping delivered until Tuesday so Monday was slim pickings in the kitchen, hence the lame lunchtime salad. Finally, onto dinners! The best meal because I have complete creative control in the kitchen and more importantly, TIME! 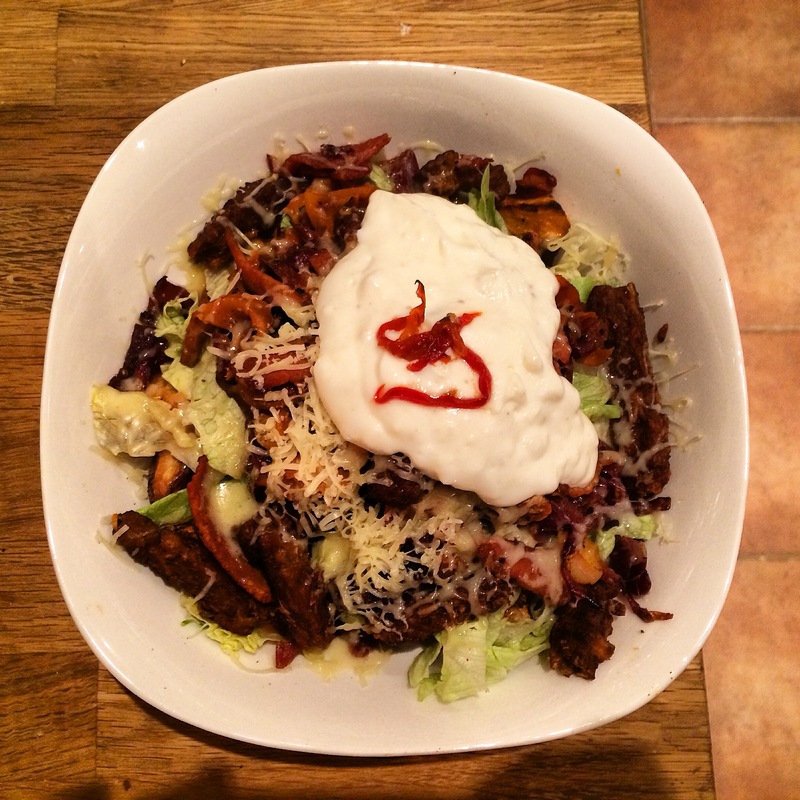 I believe that my first foray into Slimming World failed because, well, I gave up. 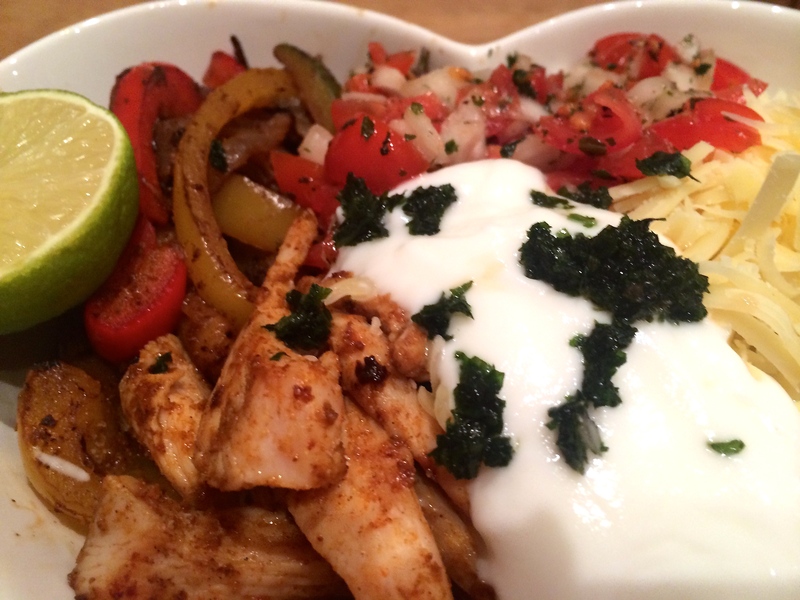 But, before I gave up, I was trying to shoehorn my favourite food into the SW plan and it just wasn’t working. Some things work great cooked the SW way, some don’t. Creamy, fattening Italian sauces don’t work so well, simply because it’s hard to replicate creamy, buttery flavours without the calories. Natural yogurt has a funny twang IMO, as does Quark. I do love using Quark, but sometimes it splits even if you’re super careful with the heat, and then your dinner is ruined and you cry. Anyway, my point is, this time I am going to try to make new dishes that I wouldn’t have tried previously that work AMAZINGLY cooked the SW way, rather than trying to make pizza crust from Smash and feeling slightly dirty. 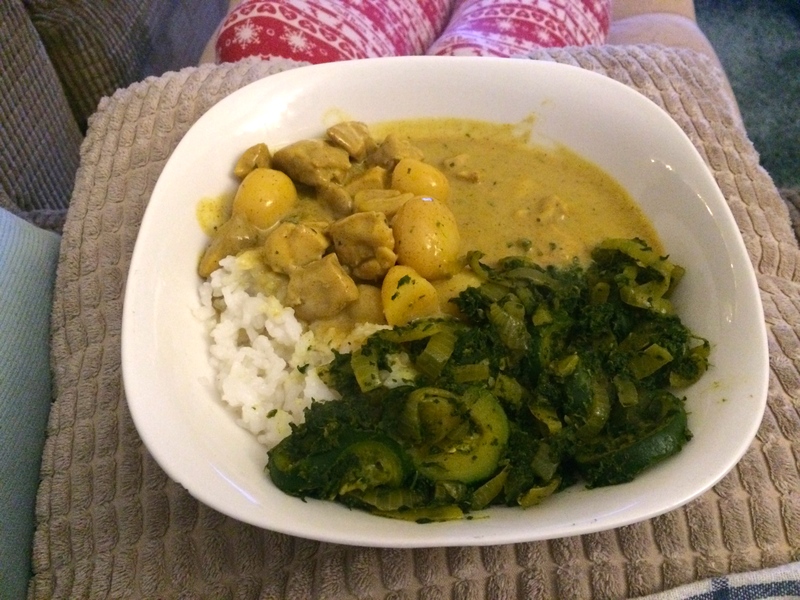 This I possibly wouldn’t recommend…I LOVE korma and I love it because of the buttery, creamy, coconutty, almondy flavours, all of which are tricky to replicate when you’re fat-restricted. The korma in the Fakeaways book (my new bible) didn’t mention coconut at all and to be honest I wasn’t having any of that. I popped to Co-Op on the hunt for a fat free coconut yogurt (fairly optimistic given the size of the shop) and unsurprisingly, they didn’t have any. They did, however, have a new ‘Pina Colada’ Mullerlight. Hmmmm….would that work?I was tired and hungry so decided it would, and bought one. I also randomly bought a tiny bottle of almond essence which I thought might be a good substitute for the almonds normally in korma. It…wasn’t great. The yogurt was okay (I sieved out the pineapple…) but even half a cap of the almond essence was too much, and it just reminded me of a cherry bakewell. Don’t get me wrong, I ate it all, but it left a weird taste in my mouth. 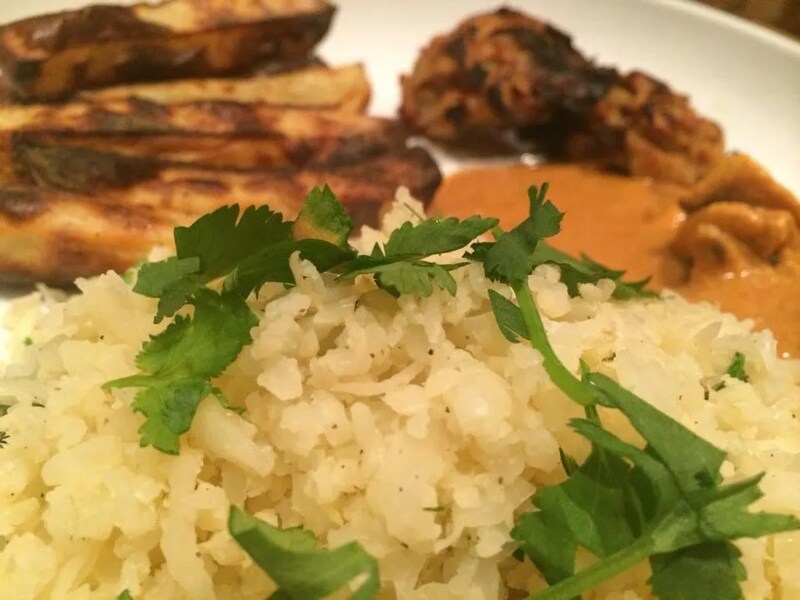 If you like curry, I’d recommend going with a tikka or jalfrezi or something more tomato based, which is better suited to the ingredients you’re allowed to use. I’m happy to report this was a much more enjoyable experience! 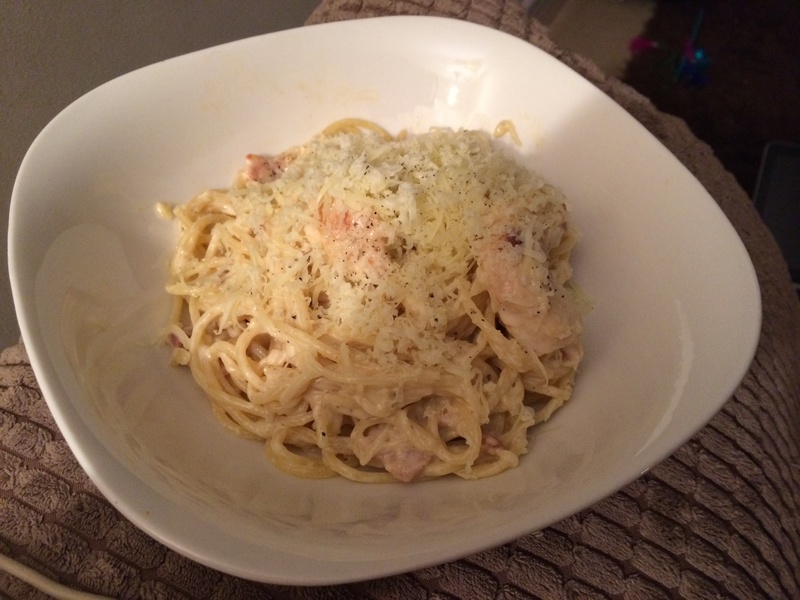 I made it as per the book, with twice the amount of garlic and chill as I like strong flavours. However, when I tried it, it was bland 😦 so I added more of each, more soy sauce, and a tablespoon of sesame oil (2 precious syns) to jazz it up a bit. It tasted a lot better after this, and a whole lime squeezed all over it completed the experience. I didn’t have any of the required veg in the recipe so I stir fried some veggies in a separate pan, and ate them alongside the pad thai to ensure I had my 1/3rd speed veggies. I halved the recipe as I’m the solo meat-eater in the household, and I have over half left for another day 🙂 Success! 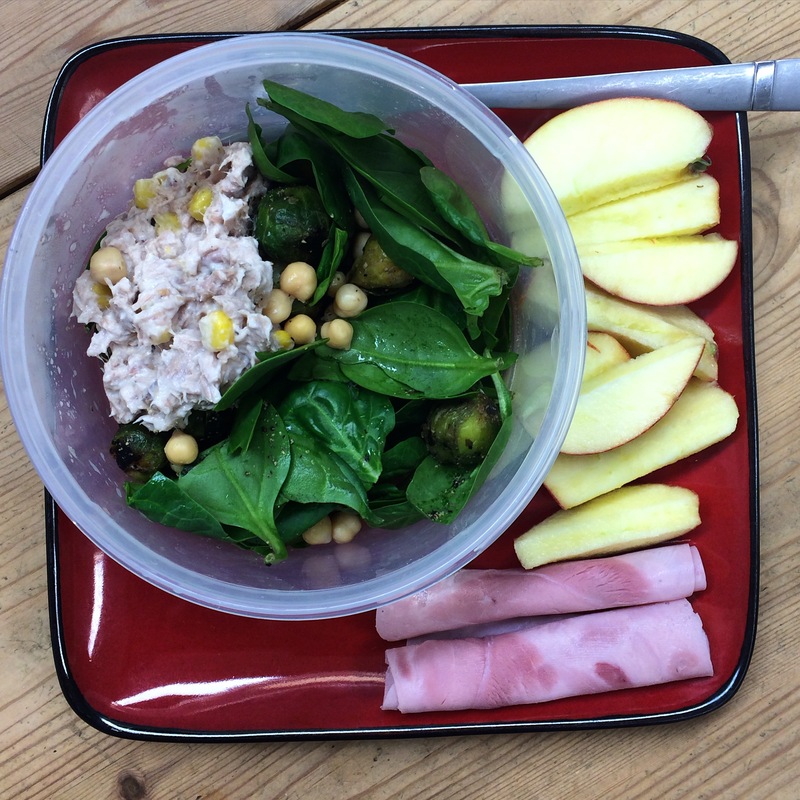 I don’t snack a huge amount but when I’ve been peckish, I’ve gone for apples and lean ham slices. Exciting stuff. My daily synage has been between 4-7 each day which i’m THRILLED with (I know it’s only Day 4 but humour me) because last year I pretty much always spent my daily 15 on silly things like condiments, wine and chocolate, which I don’t think was really helping my losses. So I’m chuffed with my restraint. I’ll leave it there as I’m knackered and it’s been a long week at work. 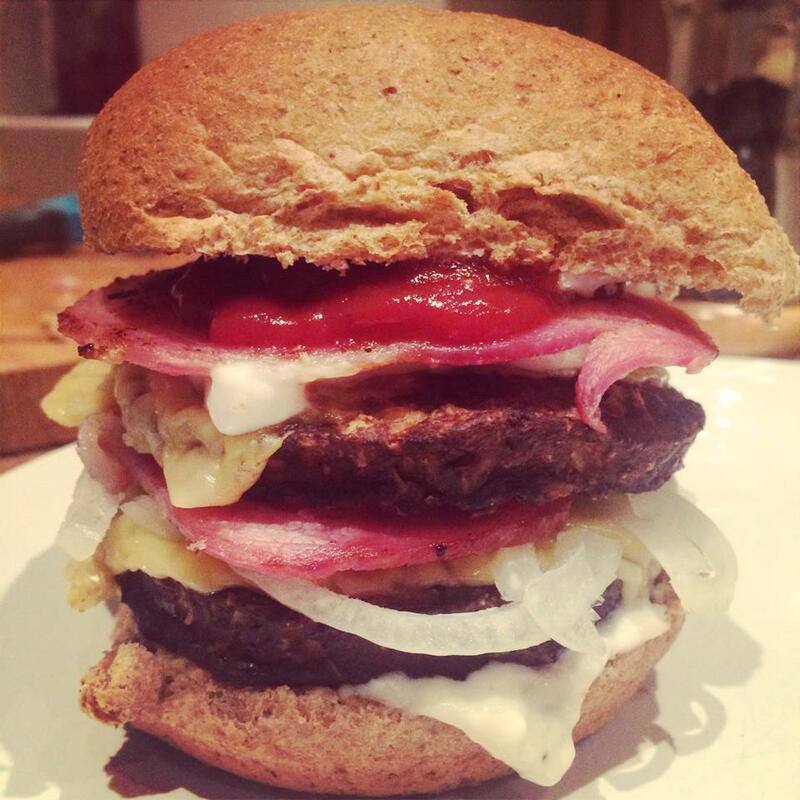 On tomorrows menu is CHEESEBURGERS, a meal that works insanely well cooked the SW way! We’ll have them with a boatload of free SW chips and I can’t wait. We’re staying in on Saturday night (January is a very frugal month for us, out of necessity!) and I’m planning to cook a lovely steak which always feels like a treat on SW. Sunday I fancy a nice winter warmer and I think I’ll do the Slimming World beef bourguignon mmmm! Hello! *waves* Remember me? I used to blog here about…oh…10 years ago, about cooking and eating out and nice things like that? Well, that miiiiiight be because it’s been over a year since I actually last blogged…and before that it was 8 months since the previous blog! Oops! In my defence though, I have been busy. You know what that means…A WEDDING TO PLAN!! 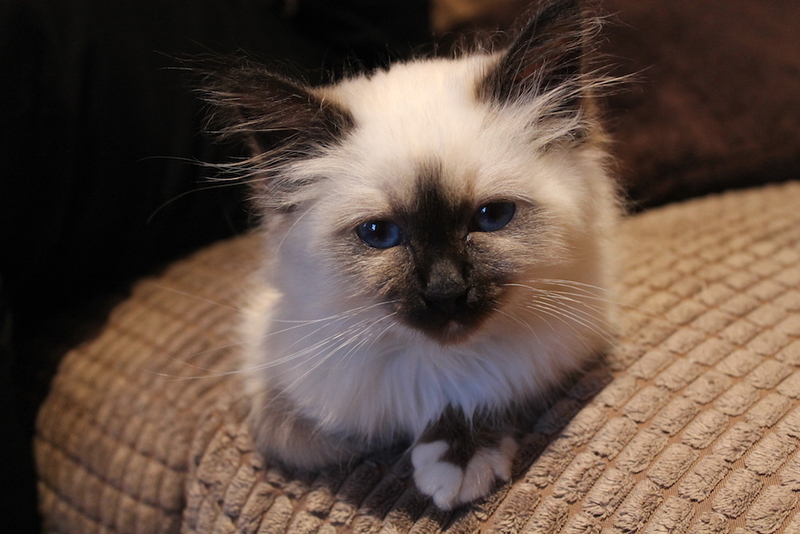 Then, when we got home, we welcomed this little princess into our home…our long-desired Birman! 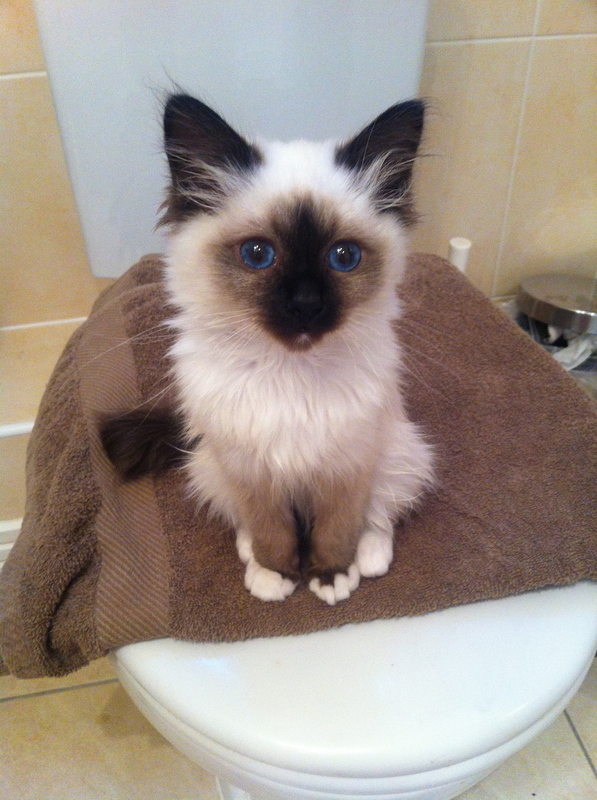 She’s called Saffie (Sapphire!) and she is just the best. THEN, in December, we found out our landlord was selling our beautiful flat! So we were house-hunting once again. Phew! On top of this, Ben got an amazing new job, we visited his family in Cumbria, we went to Disneyland Paris and Paris for a week, attended 2 weddings aaaannddd went to the Isle of Wight for a mini break. And now here I am, January 4th 2015 and wondering where the last year went!! So, the new blog direction. 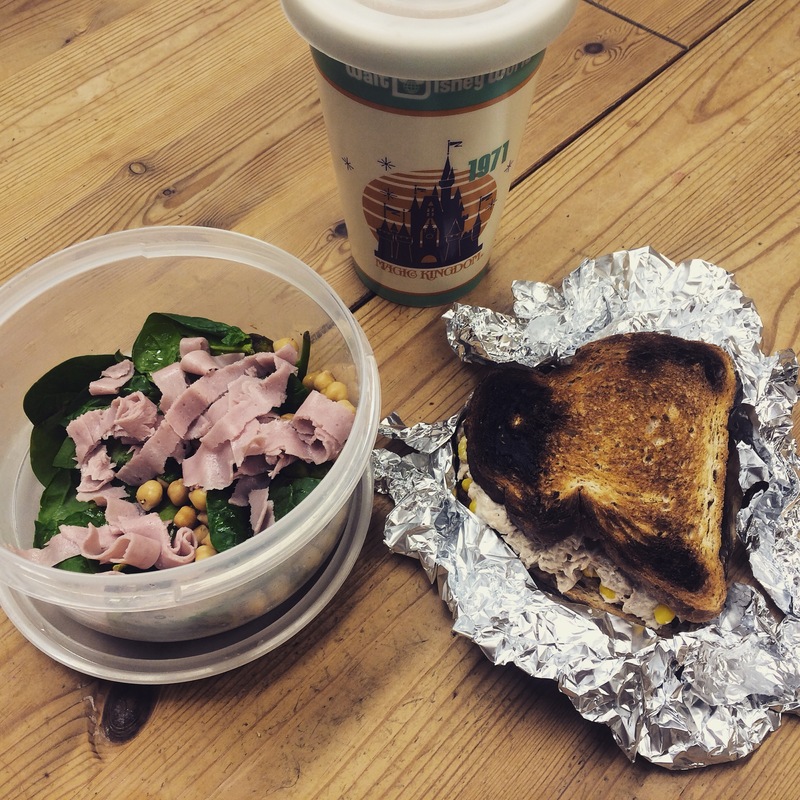 I did consider starting a new blog to document my new adventures but then I figured this is ‘My Life In Food’ and at the moment, this is what my food life is! My new adventure? Slimming World! I actually joined SW for the first time last January and lost 10lbs which I was chuffed with. However, job woes, the aforementioned house move and general stress meant I stopped going to group, started eating whatever I wanted, and put all the weight back on. And more. Oops! I am going to my local group on Tuesday to start again. And this time, Ben is joining me! He wants to lose a few pounds himself so we’re going to do it together and I’m so looking forward to it! Although we aren’t getting married until next year, I would much rather get to the weight I want to be at this year, so I’m not stressing and crash dieting right before the wedding. And honestly, we’re just both so ready to lose weight, get fit, and feel generally happier about ourselves. We’re considering joining our local swimming pool and going a few times a week which I think could be fun, and I imagine we’ll be back to the nightly walks we used to do. 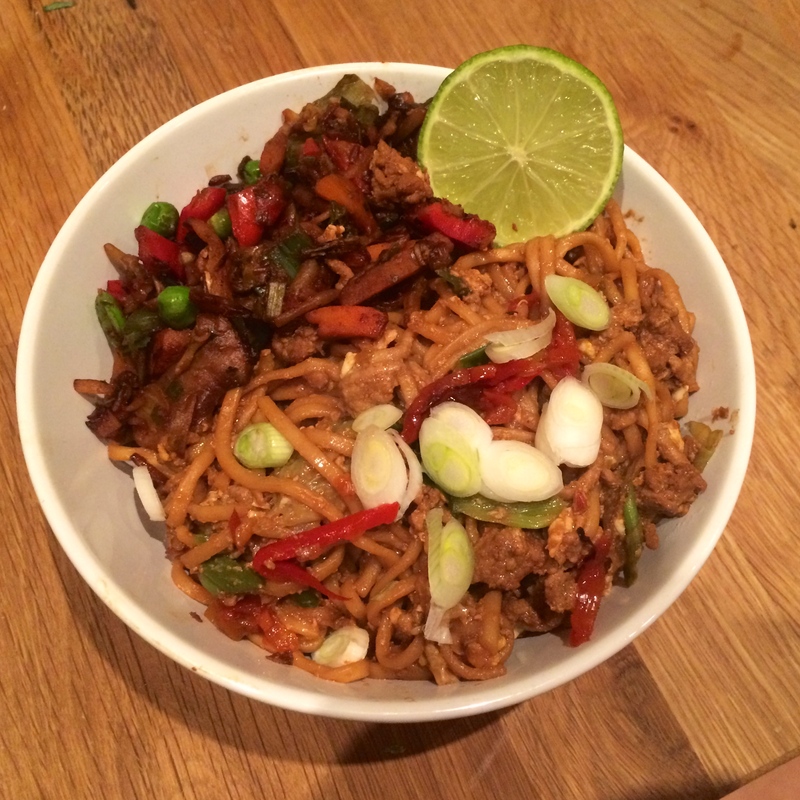 I’m going to share some photos of things I cooked last year, to remind me of all the amazing food you can eat on SW! 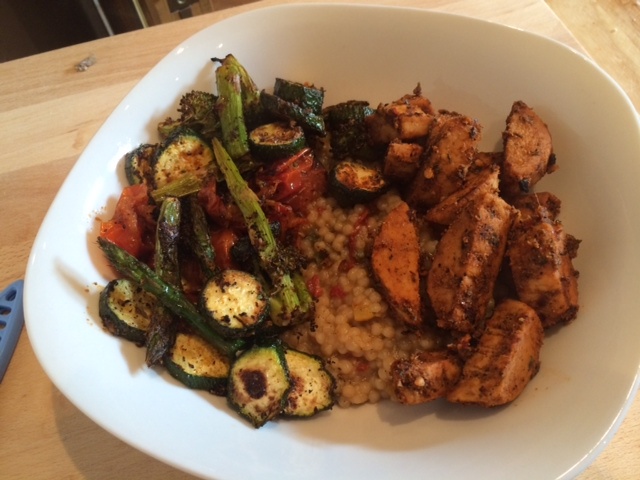 Moroccan spice blend marinated Quorn chicken, giant couscous, and roasted veggies. 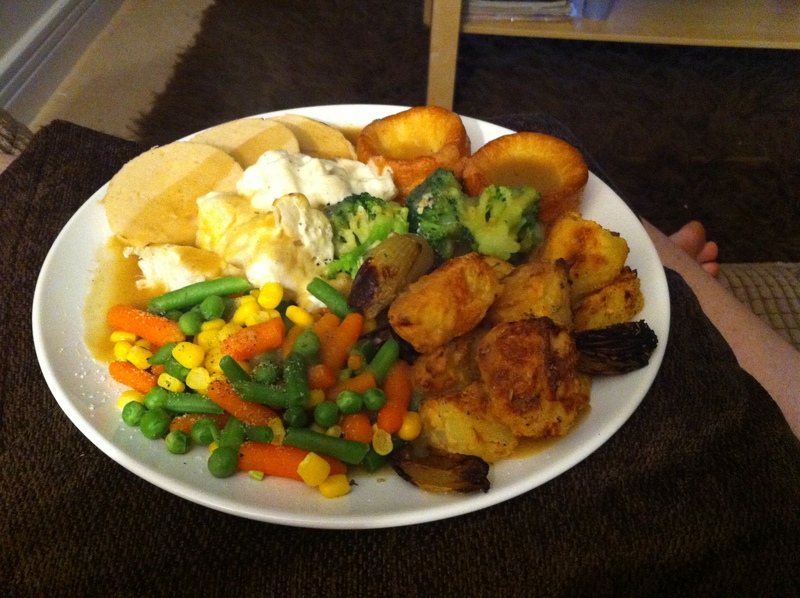 SW roast dinner – a classic! 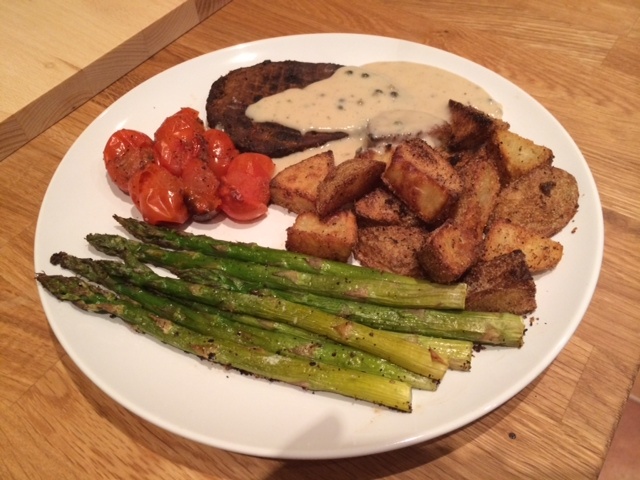 Quern peppered steak with Quark pepper sauce, roasted potatoes, tomatoes and asparagus. 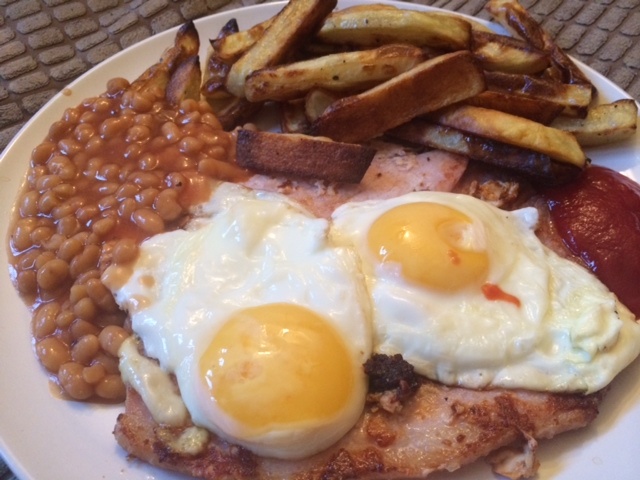 Gammon, eggs, chips and beans. So good! I lost 10lbs eating all this! It didn’t even feel like a diet! I need to say motivated and stick with this, wish me luck!